Are you lost about which of the many travel pillows to try out? We will help you find the best travel pillow to meet your needs. Our travel pillow reviews are compiled into the largest and most informative listing you will find anywhere online. In this review, we list all of the top travel pillow brands and analyze our top picks based on of 5 metrics: Comfort, Portability & Durability, Styling, Price, and Overall Rating. We will also discuss what the different types of travel pillows are. For your assistance, our top 5 choices for the best travel pillow are listed in the table directly below. To read the more thorough review, just hop right below the table. You may be amazed when you see just how many different travel pillows are out there! We have done the hard work for you and reviewed nearly every single one of them. We have a brief overview of each brand below. Simply click down to read our full review of each product. AERIS brings to the table several different types of pillows but for this review, we will be focusing on their extremely popular memory foam travel pillow. This particular pillow actually comes in a set that includes sleep mask, built-in earplugs, and a storage cover. It takes a very straightforward approach to design and implementation which helps to keep the price point somewhat competitive. AirComfy has two popular designs of travel pillows that we will be focusing on. Their “bowtie” design and their “donut” design. Both, as you might expect, utilize air to create the cushion but each does so in their own special way. The other common trait among both products is their popularity and competitive price point online. 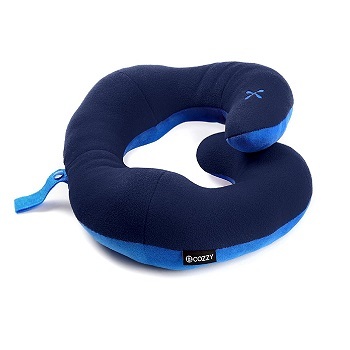 BCOZZY has a rather unique and quite popular neck pillow that they have dubbed the Chin Supporting Travel Pillow. Similar to many donut-shaped designs, this product essentially wraps around your neck. The primary difference that makes the BCOZZY travel pillow stand out from the competition is that it is much longer and actually has overlap, resulting in a chin support. This is very helpful for those who prefer to keep their entire head more upright while using a pillow. That patent-pending design is a bit higher in asking price, however. Cabeau sells a couple very interesting and popular types of travel pillows. Both of their products are based on the donut shape and utilize memory foam construction. 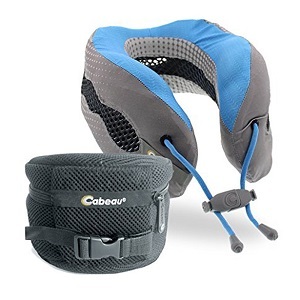 Dubbed the “Evolution” series, Cabeau’s travel pillows come in a somewhat standard offering and a much more advanced (and expensive) model that has a built-in cooling system. Memory foam-based pillows offer some unique pros and cons and Cabeau feels that they have been able to harness the inherent positives while minimizing the negatives. 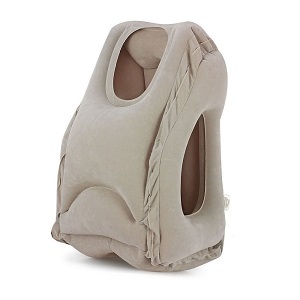 CHELIYOU has a neck pillow that is designed to attach to the back of a car seat. This can provide additional support to the back of your head and neck area but does not take advantage of any sort of chin or lower head support. It is comprised of memory foam and comes with a washable fiber velour cover. A simple approach but the with a patented design, the asking price is relatively competitive. Cloudz makes several different types of travel pillows but we will be focusing on their microbead travel neck pillow. 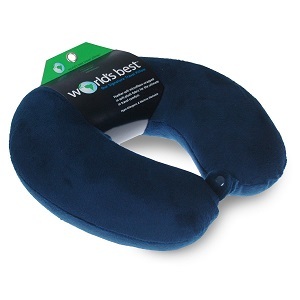 Microbead neck pillows are one of the oldest designs and have a large following. There is no exception here as the Cloudz pillow is extremely popular and one of the best sellers online. The beads have a unique texture and feel different than other stuffing and also are very low-cost, resulting in a competitive asking price. Comroll is the first of several brands that are taking advantage of a relatively new travel pillow design. Their product inflates up with air and creates a sort of “box” that is designed for you to put your arm in/hug and literally lean into like you would a traditional pillow. As you can tell from the image, the final design is a bit different than what most people think of when they see a travel pillow but it does have its merits. Also, being made of simple materials and only needing air, the asking price is very low. Crafty World has one of the most popular travel pillows online so they were definitely worth looking into. The specific name of their popular pillow is Comfort Pal. Their wrap travel pillow follows the standard shape and design of a donut that “hugs” your neck and provides head support in all directions. It utilizes thermosensitive memory foam that Crafty World feels provides adequate structure while still being easily molded to a person’s specific contours. This simple approach results in a reasonably attractive price point that should be within most people’s budget. 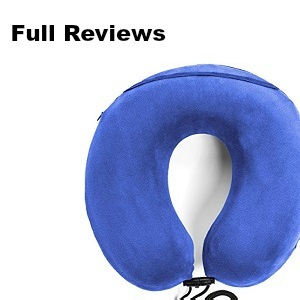 Deepsleepro has a unique travel pillow that has recently come into the online marketplaces. Upon first inspection, you will tell that it looks totally different than most other travel pillows you have seen. It resembles a thick turtleneck more than a pillow! IT has received a lot of excellent reviews but we feel that most of them are faked. This product is also a bit higher cost than many of the other products on the market. Desk Jockey, as you might have guessed from their name, specializes in products to help improve your experience while working at a desk. 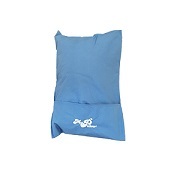 This spans into pillows and they actually have a few products that can be used as travel pillows. For this review, we will be focusing on their U-shaped neck cushion and sleep pillow combo. It has a proven approach using memory foam but tries to stand out from the crowd by also including a sleep pillow. Considering that you receive both of these items, the asking price is excellent. Edenpure utilizes the increasingly popular “inflatable box” pillow approach. This travel pillow is designed for you to put your arms inside of it or hug it and then place your head into the top hole. This creates a sort of enclosure for your body and results in levels of comfort that traditional travel pillows may struggle to achieve. The asking price is very affordable but you do have to deal with the size of it when inflated. FAMY, similar to Edenpure and Comroll, offer up the box-style travel pillow. 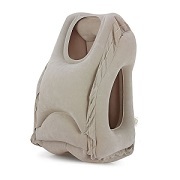 This popular design uses traditional air in replacement to memory foam or beads and its orientation results in your body being in a very comfortable position. As far as we can tell, it is the exact same design and material as Edenpure and Comroll products. Flexi (as you might have guessed from their name) brings to the table a very flexible travel pillow that is designed to be 4 different pillows in one. Thanks to its flexible design and adjustable strap, it can be used as a back sleeper, side sleeper, stomach sleeper, and lumbar support. To help with the flexibility and also provide much-needed padding, it is filled with micro-beads. It comes in at a very reasonable asking price as well. FMAB brings to the table a very interesting design for their semi-popular travel pillow. The unique shape is, according to FMAB, oriented so that it will fit snugly around your neck and also provide a comfortable area for you to lean your head back on. Its softness comes from air that is inflated inside similar to a balloon. This product is very simple in design and extremely low priced. Homca is another brand that focuses their travel pillows on the large, inflatable variety. Their body pillow utilizes the large “hugging” design that we have seen other brands do. Similarly, the asking price is very competitive but the target market is somewhat polarized down to those who enjoy air-inflated pillows and also those who don’t mind a pillow that takes up a lot of space. Homesky sells the inflatable body pillow design that has become increasingly popular thanks to its full-body experience as well as a reasonable asking price. From a design and performance standpoint, the Homesky body pillow is about identical to the many other brands that carry this type of pillow. However, they manage to be even more affordable and are able to drive the asking price of their product to the rock bottom of the budget tier. The Huzi travel pillow is one of the more original pillows we have seen on this huge review and it really stands out next to a vast majority of its competition both in looks and in how it handles keeping you comfortable. Dubbed the “infinity” pillow, it got this name due to the Infiniti (or figure 8) shape that it is in. It has a breathable bamboo fabric and its filling consist of adaptive microfibers. While it does have a really cool approach, it is more expensive than a lot of other products on the market. However, Huzi feels that the combination of comfort and performance will make their higher asking price worth it. As you might suspect, the J Pillow is famous due to its J-shaped design. Winner of the British Invention of the Year in 2013, the J Pillow is hugely popular all around the world thanks to its unique approach and successful marketing campaign. 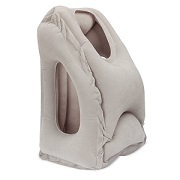 The shape of the pillow allows for a “hugging” sensation that provides extra head and neck support that many traditional travel pillows may struggle to achieve. It is also made of durable materials and the entire product is washing machine-friendly. But it does have some limitations and a higher asking price which we will discuss in the full review below. 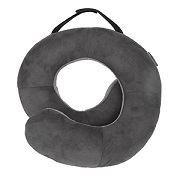 JUNING takes a very safe and proven approach in their most popular neck pillow. Their travel pillow utilizes the standard U-shaped design and is filled with extra dense memory foam. This, coupled with their plush microfiber pillowcase, results in a very comfortable and relaxing product that JUNING feels will wow you. You can also remove the pillowcase and wash it as you would a normal pillowcase. Finally, this all comes in at a very affordable asking price. Kingta is attempting to secure their piece of the travel pillow market share with their really cool twist on a proven design. Not only is the shape of their pillow more progressive and more closely molds the contours of your neck but it also comes with the carrying case built into the pillow itself. This is one less thing to keep up with and adds a lot to the overall convenience of using it. Beyond that, your standard memory foam and fabrics are used. The asking price is a bit higher than most other U-shaped pillows but still within reason. The Koncle airplane pillow utilizes the popular inflatable hugging design that we have seen many other brands do. This type of style has some very established pros and cons and will really depend on the individual as to whether or not it is a good fit. The main key to it is that it utilizes inflated air rather than a stuffing to provide padding and can simply be deflated and packed up in its carrying case when not in use. Also worth noting is that the asking price for this particular brand is a bit higher than many other similar brands online. LIANSING caught our attention, not because of any sort of groundbreaking pillow that they offer but rather how they package and sell it. It comes in a “2-pack” that includes not only two neck pillows but also 2 pairs of earplugs, 2 eye masks, and 2 matching bags. All of this comes in at a very reasonable asking price and is great for couples that are after a travel pillow. But we will break down our thoughts on the pillows in the larger review below. 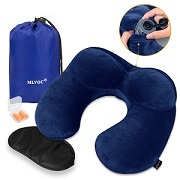 MLVOC sells a hugely popular inflatable, low-cost travel pillow that is very similar to the LIANSING product reviewed above. The primary difference is that it just comes in a single pack as opposed to a two-pack. Also worth noting is that there are a few additional color options as well. Inflatable pillows have unique pros and cons and whether it will be a good fit for you really require trying one out and seeing. Thankfully, the low cost associated with them makes it easy to do this without sacrificing a lot of money. As you might expect, My Perfect Dreams specializes in various pillows that are designed to help you fall asleep faster and sleep better. In regards to their travel pillows, they have a simple yet popular U-shape design with foam insert. This is a very standard product that you have seen many other brands offer but with a unique “My Perfect Dreams” touch to help it stand out just a bit. The asking price is also quite fair. MyPillow Inc’s travel pillow is worth noting because it is one of the few models we have tested that actually resembles a conventional pillow that you would have on your bed or couch. However, it comes with the unique twist of being able to be rolled up into an included pillowcase. This gives you the best of both worlds in that you enjoy the typical benefits of a conventional pillow while also being much easier to transport. However, the asking price is a bit higher than many other products in this category. 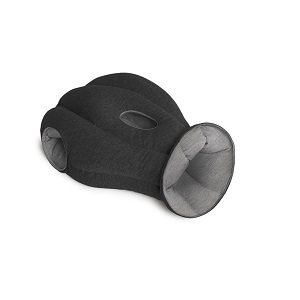 If we had to pick, the Ostrich Pillow is probably the most interesting looking travel pillow we have ever come across. It takes a unique approach in that it basically slides over the top of your head rather than around your neck or on your side. There are actually several different Ostrich Pillow sizes including the original, the mini, and the light. For the sake of simplicity (and because it is the one we tested), we are going to discuss the Ostrich Pillow original. It is worth noting beforehand that this product is very expensive as well. This is a new addition to the competition and it definitely doesn’t disappoint. It retains the great rigidity and structure that we like with the Ostrich Pillow but accomplishes it in a much more traditional and mobile manner. It also comes in nice packaging and retains the excellent memory foam feature that we like to see in premium travel pillows. While still pricey, it is still more affordable than some of the high-end memory foam pillows on the market as well. Pack4track sells a variety of items but focus on one type of travel pillow that seems to do quite well online. They have opted to go with a microbead stuffing and also utilize the ever-popular U-shape. To help stand out from the crowd, they have a pretty robust adjustable strap that is built onto the pillow that allows for easy adjustments depending on your neck size. Also included are a set of earplugs, eyemask, and a carrying case. The asking price is a bit higher than many other brands but you do get a lot of items for it. 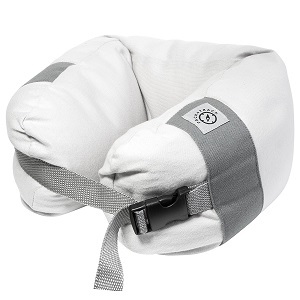 Parvbo Outdoor made it to our huge review with their very ingenious travel pillow. The main aspect that makes this particular product stand out from a lot of the competition on here is how it works. Rather than create a thick barrier that hugs your neck and keeps it in place, the Parvbo Outdoor travel pillow acts more like a sling where it uses tension to keep your head upright. The result is a very solid and secure support structure that should keep even the droopiest head in place. It doesn’t have the huge internal stuffing component like most other pillows have, however. Also, it is more expensive than most. Royal Limits is another brand that has a single popular travel pillow that stands out from a lot of the other products we have reviewed on here. Their pillow has a very “interesting” shape and many people would think it looks like a giant question mark. It does not has a stuffing and rather is inflatable. Also, there is a clip at the bottom that allows you to clip it to your belt. Considering the size, the asking price is quite reasonable for such a large product. Simptech offers up a couple different travel pillows, both of which focus on the inflatable and large design approach. For the sake of variety, we are going to focus on their lay down pillow (they also have one of the inflatable hug type pillows that sit in your lap but we have reviewed that one many times before and Simptech’s offering is essentially the exact same). Their other pillow is quite different in that it is intended to be placed under your legs rather than behind your neck. This makes it a sort of travel ottoman. Travelmate sells a host of travel pillows but for this review, we will be focusing on their most popular example (and coincidentally one of the most popular travel pillows sold online). Their standard memory foam U-shape neck pillow is a huge hit. This is likely due to its simplistic approach and attractive price point. But is there more to this popular item than meets the eye? Check out our full review below. Travelon is a travel brand that sells many different travel-related items. Within this, there are several pillows and pillow accessories that they offer. We will be focusing on their wrap-around pillow mainly due to the popularity of it as well as it is a new style that we have not come across. It is inspired by the traditional U-Shape pillows but Travelon has made some alterations including making it longer to the point that there is actually overlap in the front. This can assist in providing additional chin support. For softness and structure, it is stuffed with typical foam. 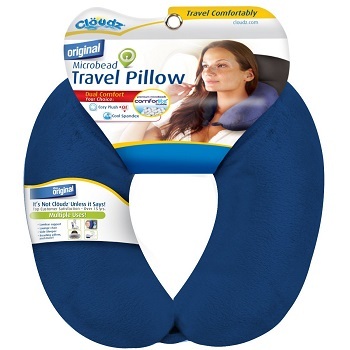 The Travelrest travel pillow is another extremely popular pillow sold online. It is quite unique and totally different than just about every other product we have reviewed on here. It is designed to lay over and across you in a manner similar to a seat belt. This allows you to rest your head on it from the side while also giving your shoulder support. It is inflatable and can be quickly deflated for easy storage. It is a bit higher in asking price but Travelrest hopes that their very non-traditional product will justify the slight upcharge. TravelSnugs takes a very safe approach in their travel pillow. They offer up a standard U-shape travel pillow that has a memory foam core that they feel leads the pack in terms of softness and comfort. It is important to know right out of the gate that this isn’t a firm pillow that is designed for people with neck problems and that are looking for something to force their head into place. In fact, TravelSnugs explicitly states this in their product description! Rather, this pillow is made for people who want something that is simply comfortable and easy to use. Added features such as an elastic strap and removable washable cover help to make this product stand out from the rest. The asking price is about average. TripComfy is attempting to reset the travel pillow game with their very interesting all-in-one package that they call the Zen-Cradle. Starting with a pretty typical U-shaped designed travel pillow, they have added their own special flares by including a full hood and sleeping mask that is designed to cover most of our head for a 360 degree enclosed feel. The cover can also be removed to be machine washed as necessary. The asking price for this package will scale up into the premium price range compared to other travel pillows, however. Trtl sells a few different types of neck pillows but for this review, we will be discussing their very popular soft neck support travel pillow. Rather than utilize a thick shell or high levels of padding, the Trtl travel pillow instead relies on built-in plastic ribs to provide essential neck support. This results in a very firm fit that can hold even the heaviest head but it does sacrifice some of the softness that a traditional pillow possesses. The asking price for this product is into the premium price range but it certainly approaches proper neck support in a unique way. The last of our travel pillow reviews is going to be the World’s Best Feather Soft Microfiber neck pillow. While World’s Best does have many other pillows that they sell, we are going to focus on this particular model in this review. The thing that first got our attention with this product is its internal feature: it is made of feather-soft microfibers that World’s Best feels emulate the feel of many down blankets or other feather-based sleeping items. It is wrapped in a traditional U-shaped outside and comes in a huge range of colors. Also, the asking price is very reasonable. 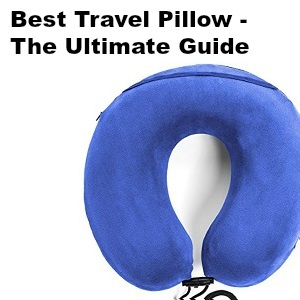 There are many factors that go into figuring out the best travel pillow to meet your needs. We list and explain the various metrics that we use below. This metric is probably the most important consideration that people focus on when researching and testing travel pillows. Comfort refers to how comfortable the product is. Obviously, this metric can be quite subjective. For instance, some people may prefer a firmer pillow while others opt for a softer. Also, there are preferences on pillow shapes, sizes, and what sort of stuffing they have. However, there does typically seem to be a consensus among most people as to whether or not a pillow is comfortable. In our reviews, we have tried to specify what sort of comfort levels a particular model will have. This will help you to hone in on which pillow will best meet your needs depending on what type of comfort you are after. We decided to lump portability and durability together as they had quite a bit of overlap. Portability refers to how portable the product is. This is actually a very important metric as travel pillows are often being used on airplanes or busses where storage space and mobility are extremely important. Many travel pillows have realized this and offer unique ways to minimize how much space they take up. This includes things such as being collapsible, able to be deflated, comes with a carrying case, etc. As for durability, this refers to the build quality and how well the unit will hold up to typical wear and tear. The choice of fabric and the quality of stitching tend to be some of the most important variables that we focus in on. Styling refers to the looks of the travel pillow. Most would consider this the least important of metrics but it is still worth going over nonetheless. There is a huge range of different stylings for travel pillows. Some are very mundane and conservative looking while other, for lack of better words, make you look quite ridiculous. For those who prefer to keep a low profile and avoid funny stares while traveling, having a more conservative style may be a bigger priority than you think. The asking price is almost always a consideration no matter what type of product we are reviewing. The good thing about travel pillows is that, even on the higher end, almost all of them would be considered to be reasonably affordable by most people. However, there is still an established price range with the cheapest examples being several factors lower than the premium models. This is the “big picture” and it paints an overall view of how well a particular model or product fared. As a rough rule of thumb, anything that scores a 3 or higher is considered an acceptable purchase. Anything scoring a 4 or higher we view as being a strong purchase. And for those products lucky enough to score a 4.5 or a 5 out of 5, we consider those to be fantastic products and some of our best buys. Below are our extensive full reviews for each travel pillow. We go into great detail about the specific attributes of each and how they fare in our rating metrics. We are big fans of memory foam travel pillows if they are done correctly and AERIS, for the most part, has it down. The material used is somewhat firmer memory foam but, combined with the breathing holes, allows for adequate flexibility and compressibility. There are also adjustable toggles that can help to orient and “hug” this pillow to any size neck. Where this particular travel pillow really shines is in car seats. Being able to recline back a bit is very important as the “donut” shape coupled with a firm material means that you may end up being leaned too far forward if you try using it in an airplane seat (which typically don’t recline forward very far unless you are in first class). The fact that it isn’t optimized for non-reclining seats is our only real complaint. The included storage cover is a great idea and makes it very easy to pack everything up that comes in this set. The pillow, when in use, doesn’t take up a ton of space and shouldn’t bother your neighbor sitting next to you. When putting away, the memory foam can be compressed to a small ball and easily tucked inside the cover along with the sleep mask (which obviously doesn’t take up much room). Another really cool feature is that the earplugs are actually attached directly to the pillow which means that you don’t have to worry about keeping up with them and can simply store them away with everything else. Build quality is good and we have not received any complaints. The AERIS memory foam travel pillow comes in a few different color schemes including black, blue, olive green, and purple. The pillow itself is a very conservative shape and the design that most people will associate with neck pillows so you don’t have to worry about getting funny looks when taking this out on a plane or bus. The asking price here is a bit higher than other brands that use this simple travel pillow design but part of the upcharge is because it also includes a sleep mask, earplugs, and a carrying case. You are also paying a bit extra for the name, as AERIS is one of the more popular online retailers for travel pillows. All in all, the asking price is fair. 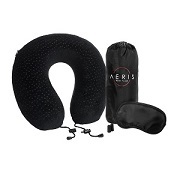 The AERIS memory foam travel neck pillow is a very popular product thanks to its proven approach and handy extras. The memory foam, while firm, provides good support and is comfortable to use. The added extras of a carrying case, earplugs, and sleep mask are nice additions and directly contribute both to the effectiveness as well as the portability. Our only minor complaint is that the donut shape and firm memory foam may be a bit too much for a tight airplane seat where you can’t lean your chair back. But for every other application, it is a solid choice. Finally, the asking price is not industry-leading but plenty competitive considering what all you receive. AirComfy utilizes air as its method of padding. 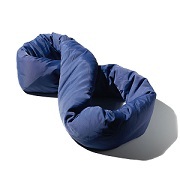 You simply blow up or pump up (in the case of their donut neck pillow) the inflatable shell to your desired setting. For those who have only experienced padding or memory foam travel pillows in the past: air pillows have a completely different feel. Whether it is for you is up to personal preference but we have seen that most people seem to enjoy air just as much if not more than memory foam. This is because of the extra flexibility you get. If you are someone who enjoys a less firm pad then simply take out some of the air while if you enjoy a much firmer experience just air it up more. The only issue with air compared to foam is that you won’t get the unique contour effect that memory foam has. But the ability to mold the pillow to any setting (even vertical chairs on airplanes) makes up for it. Also, the fabric used on both AirComfy products is quite nice and helps to reduce sweat (which can be a common issue on travel pillows with thicker fabric). The fact that you can deflate AirComfy neck pillows helps enormously in minimizing how much space they take up. You simply take out the air and fold it and it barely takes up any room at all. As an added bonus, these products also come with their own carrying case. While using, the ability to adjust the air also means that you have great control over how much room it takes up. But even when completely aired up, you shouldn’t have an issue using this product without disturbing your neighbor or side passenger. There have been some complaints about the air nozzle and air pump going out prematurely on some products but AirComfy has been very vocal that these incidents are rare and are manufacturing defects that are covered under warranty. We don’t see this as a major issue. There are quite a few color options in the donut style but only a couple of colors that we have come across in the bowtie style (brown and black). The bowtie style also doesn’t utilize the plush fur-like fabric that we commonly see on travel pillows and looks more like a weird sort of inner tube or pool toy. But overall, it is a safe look. The asking prices are relatively competitive. The fact that AirComfy products don’t utilize internal foam helps to drive their prices down. The bowtie style travel pillow, in particular, is very competitively priced. You do have to manually air it up, though. So for some, the added expense of the built-in pump on the donut style is worth the slight upcharge. AirComfy travel pillows utilize traditional air as means to keep you comfortable on long trips. Air has several unique benefits over traditional foam including the ability to adjust the firmness to your liking, allowing for easy transportation when the air is removed, and also driving down the costs to make. The combination of comfort, usability, and cost makes these products very attractive. There is a good reason why AirComfy pillows are among some of the best sellers in the industry. We found the BCOZZY travel pillow to be very comfortable. It has a similar feel to most donut design pillows you have experienced except that it is much longer, resulting in multiple layers of padding. As for the padding, it is made of semi-squishy bounce back stuffing. You can actually orient the pillow to different configurations depending on what you are after but the most popular way is to simply wrap it around your neck in a way that it gives your chin a support. There is plenty of overlap so no matter how thick or thin of a neck you have, it will be able to accommodate you. The only complaint we have seen (and it is few and far between) is that some people who are warm-natured may found themselves becoming too warm with how much fabric is holding their skin. But again, this is on a case-by-case basis and didn’t bother us at all. Since this is a larger travel pillow due to the increased length, it does take up a bit more space than your traditional donut shape. It can’t really be compressed to the level of some other pillows much due to the bounce-back stuffing. It does come with a handbag that helps for carrying and storage, however. But, while it is a bit larger, the way it is designed to wrap around your neck means that it doesn’t really protrude out any more than a typical donut design. The build quality is perfectly acceptable as well. You shouldn’t have to deal with premature tear or rips in the stitching which can be a common issue for this type of travel pillow. There are tons of different color choices to pick from which we definitely appreciate. BCOZZY also adds to this by making them two-tone color designs. No matter what your color preference you will find something that meets your needs. Our personal favorite is the silver with red accents. This is a bit larger and more elaborate of a travel pillow, however, so you may attract more attention than you would with a conventional design. You will pay a bit more for this product. This is likely due to a combination of the patent-pending technology as well as there simply needing to be more fabric and material to construct this pillow. However, the price is still reasonable and we feel it is justified for what you get. The BCOZZY Chin Supporting Travel Pillow takes a proven design and adds its own twist by increasing the length. This results in a product that has overlap and gives you a much-needed chin rest. For people who prefer to keep their heads more upright during a plane or car ride, this is a great feature to have. The material and padding used is of acceptable quality and is comfortable to the touch. The asking price is a bit higher than some other products we have reviewed but is still perfectly acceptable and a good deal for what you get. We definitely recommend the BCOZZY travel pillow. The memory foam used in these pillows is of very good construction and shape and provides excellent support for your neck and head. A common issue with softer materials is that they will give easily, resulting in your neck snapping down when you fall asleep. That isn’t a concern here as the travel pillows provide good support and only collapse when you want them to. You just need to be sure that you tighten the built-in adjustment strap tight enough so as to provide support under your chin. The fabric used (soft velour) is also quite comfortable. The biggest drawback of memory foam is that it tends to get quite warm when making direct contact with your skin. To combat this, Cabeau installed side vents on their more expensive models as a sort of “air conditioner”. Basically, when you compress the pillow, it would push out air and help cool. While an original idea, we didn’t really see it have a big impact in the long run. So if you are a warm-natured person you may find these products a bit too warm. On the opposite end, however, if you happen to be cold-natured then they will be perfect for you. The memory foam is able to be easily compressed and stored away in the included carrying case. The higher end model that has holes in the sides is easier to compress since it doesn’t utilize as much foam, but in both cases, you shouldn’t have an issue being able to tuck it away. When being used, the donut-shaped products huge your neck tightly and don’t occupy a lot of outside volume. As for build quality, the sewing and fabric are top-notch and also washing machine friendly. There have been some complaints of the memory foam cracking prematurely but it doesn’t appear to be a huge issue and we assume/hope that the manufacturer would replace defective parts under warranty. While the traditional travel pillow comes with traditional styling, the more advanced air-cooled example presents a much more progressive look. It comes with a sort of mesh netting on the side which really makes the Cabeau Evolution travel pillow stand out from the competition. Beyond that, there are multiple color options, with the cheaper model having nearly a dozen different color schemes to choose from. The main drawback of these products is their asking price. The lower-end model is on the higher end of the spectrum while the premium, air-cooled model is among the more expensive travel neck pillows you will come across. This is partially attributed to the fact that memory foam is a much more expensive material that traditional stuffing, beads, or air. And it also is partially because of the multiple patented features you will find on these products and the included earplugs. That being said, it may simply be more than some people are willing to pay for a simple neck pillow. The Cabeau Evolution travel pillows take a very refreshing approach to this product category thanks to their memory-foam based designs. We really like how Cabeau is trying to think outside of the box by creating slots to cool the pillow (as memory foam is notorious for being quite warm). However, we didn’t see a real big effect on temperatures cooling down while using them. The styling is also superb and comes in plenty of color choices. Durability and portability are also acceptable. The main issue we have is the high asking price. While these utilize a more expensive lineup of materials, it may go over some people’s allotted budgets. Still, for those who are willing to pay the premium price, you will enjoy a very good memory foam travel pillow. The memory foam is comfortable albeit a bit firm. If you are someone who is after a super soft and moldable internal stuffing then you may find that this is a bit too stiff for your liking. Also, this travel pillow is designed to give your neck and the back of your head support and does not assist in keeping your head upright. So if you are someone who tends to dip your head down when you fall asleep or become comfortable then you will still have that issue here. That being said, the patented groove design is quite comfortable when you lean back into it. And you don’t have to deal with heat issues that are common in memory foam-based pillows that completely wrap around your neck. This is one of the smallest travel pillows we have come across. This makes it extremely portable and you can put it just about anywhere without taking up a lot of space. That major issue is that there isn’t any sort of carrying case so you won’t be able to compress it and tuck it away like you can with many other travel neck pillows. Also, it is designed to be attached to the back of a chair so if you are sitting in a non-standard chair or a chair without a backing it will have no benefit to you. The construction is acceptable and the fabric and stitching have no reported issues of premature failing that we could come across. 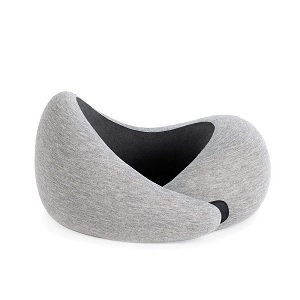 A very straightforward design, the CHELIYOU neck pillow doesn’t try to wow you with design features or color options. In fact, you are stuck with a single color choice: red. This is great for people who want to blend in with the crowd and the thought of wearing a huge and elaborate pillow frightens them. But for those who like to make a bit more of a statement: you may be disappointed. The asking price is somewhat competitive and falls into the budget category. This is a very simple and small product so we aren’t surprised that the asking price is on the low end, despite using memory foam (which tends to drive the price up). It is a very affordable travel pillow but it does come with noticeable limitations that we outlined above. The CHELIYOU travel pillow is a simple design and approach that work well for its target audience but is limited in its scope. Lacking front and side support, it is really intended to rest your head back on in an automobile and/or office setting and may not be of much use to you if you are on an airplane and/or want something with more head support. It is also limited in styling options and features but the result is an attractive price point. We aren’t super overwhelmed with this product but for people with the specific needs that it meets it may work for you. Microbead neck pillows are very hit or miss for people. Some love how they feel while others don’t enjoy them. Microbead neck pillows typically are not nearly as firm and rigid as other neck pillows. This can be an issue for people who tend to drop their head or that prefer something that does a better job of keeping their head and neck aligned upright. They also won’t form to the contours of your neck and head nearly as accurately as, say, memory foam. But they do come with some inherent benefits as well. They are much “squishier” than most other mediums (which some people love). Also, the beads do a much better job of displacing heat which is good for people who find they become too warm while using other types of travel pillows. 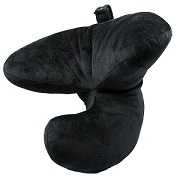 The Cloudz microbead neck pillow also has the unique feature of being double-sided, with one side having plush and the other having spandex. Some people prefer one side and other people prefer the other side but having multiple options is always nice. This is a traditional donut-shaped design which is about the middle of the road when it comes to how much volume it takes up. The major issue with microbeads, however, is that they cannot be compressed into tucked away into a storage area nearly as well as with other mediums. While you may enjoy a small carrying pouch with an air or memory foam travel pillow, you won’t have that here. This means that you need to plan to have a larger area to store it when not being in use. Tucking it away in a small purse, for instance, most likely isn’t possible. The construction of this product is simple and effective and the stitching should hold up fine. The only issue is that when these things break it is usually pretty bad as the beads can fall out and get everywhere. Because of this, extra care needs to be taken while using. This is your standard donut design that isn’t adorned with tons of aesthetic features. There are a little over half of a dozen of color choices which is nice but they are all solid colors and don’t have any sort of pattern multi-color scheme to them. This is not a major issue if you prefer something simple and non-flashy. This is an extremely affordable product and among the cheapest travel pillows you will find. The microbeads are very low-cost and the lack of advanced (and expensive) features means that the asking price should be within everybody’s budget. The Cloudz microbead travel neck pillow takes advantage of a tried and true approach of stuffing a donut-shaped pillow with microbeads as opposed to more exotic and expensive materials like wool stuffing, memory foam, etc. Microbeads have a very interesting texture and performance that may be perfectly aligned with the needs of some while not providing the rigidity and flexibility others are looking for. We recommend testing out a few microbead pillows first to see if you enjoy them. And, assuming that you do, this particular product is an excellent value. While there are a couple different orientations that you can use, they all center on the same basic approach: you “hug” the travel pillow and rest your head on top of it. The air provides the necessary support to keep your head relatively upright and the built-in grooves hold your arms in place. We must say that this is certainly a different feel that you will get with a traditional travel pillow that you simply wrap around your neck. The added support that you get from the button of the structure allows for even the heaviest head to easily be kept in a comfortable position. The only issue you may run into is if you are a particularly large person in which case you may find yourself having to lean too far down. But for people of most sizes, it works fine. 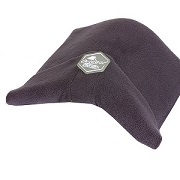 The fabric used is a sort of rubber with a soft plush finish and is relatively comfortable. Seeing how this product requires air to operate, it takes up extremely little space when deflated and you can fold it up and tuck it away just about anywhere. That being said, it does also mean that you will have to air it up before it can be used. Also, when inflated, it is much larger than most traditional travel pillows and it will also occupy all of your lap space, making it impossible to be on a computer, tablet, etc. You may find that it also causes your arms to stick out a bit more and it may interfere with your neighbor on a packed coach flight. There is also the issue of the smell. Some people with sensitive senses of smell (particularly to rubber) may be turned off by it. This issue is only amplified seeing how it is designed for you to basically stick your nose into it. The build quality is cheap but it does function. But since it is relatively thin rubber it is important to make sure that you don’t scratch or puncture this travel pillow or it will lose all functionality. This is certainly a unique style for a pillow and it will attract a lot more attention than traditional designs, be it good or bad. There is also little in the way of color choices. While looks are subjective, we don’t find these particular styles of travel pillows to be very attractive. One of the biggest positives of the Comroll inflatable travel pillow is in the awesome asking price. It is among the most affordable pillows you will find. Since it doesn’t need any sort of stuffing and the material used for construction is essentially rubber, the manufacturing costs are very low which allows Comroll to charge very little for one of their products. The Comroll travel pillow is certainly unique in its design but we must say that it performs quite well. The added support you get from the inflated base allows for a very comfortable ride, be it in a car, plane, or train. It also means when not in use, it is easily stored away without taking up much space. However, it does come at the cost of being very bulky and rather unattractive when inflated. The great asking price along should warrant someone who is curious about this type of travel pillow to give it a try. The memory foam used here is of good quality and contours very well to your neck area. It is a bit on the firm side, however, so someone who prefers more flexibility may find it a bit much. We really like the soft fabric that is used on the outside (plus it is machine washable!). The only minor issue worth noting is that the shape of this travel pillow is pretty wide. This means people with shorter necks may find that they don’t have enough room for their chin which could, in turn, cause their head to tilt up in an uncomfortable manner. Thankfully there is a bit of adjustability that can assist with this issue, though. Memory foam can be easily compressed to take up less space and this product comes with a carrying bag that you can put it in. This helps to limit how much space it takes up but you won’t find it collapsing as much as, say, an inflatable travel pillow is capable of. 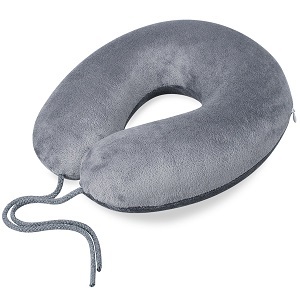 While the donut-style neck pillows tend to not take up a lot of space, this one does seem a bit larger so it may occupy more volume than you are used to. However, it is still reasonable and should not affect those sitting next to you. The build quality with Crafty World’s Comfort Pal travel pillows is excellent. The material and stitching are very well done and should not break prematurely. Also worth noting is that they stand behind their product with a 5-year manufacturer’s warranty. This is a very safe design and one that you have likely seen many times before. There are only 3 color choices that we have come across, however. We do wish that they had a few more colors and/or patterns to choose from but at the same time, it does mean that they won’t stick out as much as other pillows (which some people actually prefer). The asking price is reasonable and right in line with what a lot of the competition is asking for their memory foam neck pillows. The fact that the manufacturer is so active with its customers and offers a great warranty does give this product a slight bump over the similarly-priced competition. The Crafty World Comfort Pal travel pillow is among the best-selling pillows you will find and for good reason. Their approach is simple and proven and will meet the needs of a lot of people. The memory foam, while firm, is still comfortable and the build quality and customer support is excellent. For those who want a straightforward neck pillow, this is a strong choice. The fabric used here is quite comfy. It is very soft and reminds us of something you would find on a thick blanket for your bed. However, beyond that, there are some major issues. There simply isn’t enough support to this product to be a viable pillow. Being essentially thick fabric, there isn’t much of an internal structure that provides rigidity. This means that your head will likely drop or sag when you fall asleep, something that travel pillows are supposed to be designed to avoid. Also, the fabric can get a bit warm and people who a notorious for being warm-natured will find themselves sweating when using this. Seeing how this is basically just a thick miniature blanket, storing and transporting it is very simple. It doesn’t take up a lot of space both when you are using it and also when you are storing it. It is also quite flexible and can be manipulated to just about any shape or direction. The build quality is fine on it but, as we mentioned above, there really isn’t much to it that can fail since it is basically just thick fabric. There are a handful of color choices but all are mono-color and look rather plain. If you are someone who is dead-set on using something that is as mundane as possible then the Deepsleepro travel pillow will be perfect for you. For such a simple design and lack of features, the asking price is way too high. Yes, the fabric is comfortable but there is no internal structure and/or stuffing nor are there any special accessories that can justify the relatively high asking price. The Deepsleepro travel pillow has an original approach that we haven’t seen any other company do but there are simply too many important features lacking. The lack of structure or support means that people will find their heads and necks dipping down more than they like. The asking price, considering what you are getting, is also way too high. Perhaps a redesign with a more rigid frame could improve things but as it stands, we can’t recommend this product. From a comfort standpoint, the U-shaped travel pillow is pretty straightforward. The memory foam used is decent quality and rigid enough to meet most people’s needs. It also does an acceptable job of staying cool (which can be a challenge with memory foam pillows). The uniqueness comes into play when you add the included sleep pillow. This pillow is designed to be put behind your head. 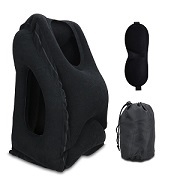 This gives you neck support thanks to the neck cushion and also back head support thanks to the sleep pillow. We must admit that the combo is quite nice. The fabric used is plenty comfy and it results in a wonderful experience. The main problem is that there really isn’t a way to mount the sleep pillow behind your head. You basically have to lean back into it which can cause it to slip. If Desk Jockey could design the cushion to be able to be tied onto the back of a seat (particularly in an airplane) then we would have a home run in terms of comfort. 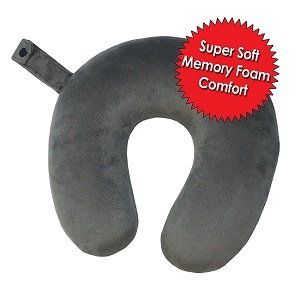 The inherent issue present in most memory foam neck pillows is that they don’t collapse as well as other types of travel pillows. The memory foam, while moldable, tends to be a bit more rigid and want to keep its original shape. Many brands have designed carrying bags that sort of “force” the pillow to stay small. In this case, you have to deal with two pillows instead of one. While Deck Jockey has included a carrying case, it doesn’t really collapse the pillows and rather just holds them in place. This means that this combo pack takes up a lot of space and will not fit in most purses or even small bags. That being said, the build quality is very good. Furthermore, the manufacturer is very involved with their customers and quickly and efficiently deals with quality issues to resolve them. We only saw one color option and it is a dark gray. This is a safe and non-attention grabbing color but for those people who prefer to stand out, you may be a bit disappointed. The packaging is excellent, however, and the two pillows fit nicely in their designated spots in the included carrying case. We actually did a double take when we saw the price for the Desk Jockey travel pillow set. It is among the most affordable options out there and this is despite including two pillows! The fact that the pillows are made of quality materials and perform fine is an even bigger plus. The Desk Jockey travel pillow set stands out from the crowd by including two pillows, both of which are rather comfy. While you may have issues properly fastening the back sleep pillow behind your head, the inclusion of it at all is a huge plus. The build quality from the stitching to the internal memory foam is very nice and customer support is spot-on as well. And for the awesome asking price, we have to highly recommend this product (particularly if you are on a tight budget). This is a very comfortable pillow thanks to the optimized design. The way that your head is essentially suspended in the inflated body results in excellent support and is great for those who constantly deal with sore necks after long flights or bus rides. The travel pillow is inflated using air so you will have a response similar to how it feels to handle an inflated pool toy. You won’t get the squishiness or the ability to contour that you find in memory foam, padding, or even bead travel pillows. This might be an issue to some while others will actually prefer this style. Another good benefit is that body heat seems to displace better with this style, meaning those people who are warm-natured won’t struggle as much. The only major concern is that these products are a bit lacking in size flexibility and people who are tall or wide may struggle to use them comfortably. When deflated, the Edenpure travel pillow is extremely easy to transport. This is because it utilizes air so when not filled up, it is nothing more than a deflated pool toy. This makes it super easy to store just about anywhere. However, when inflated, it will take up more space than just about any other style of sleep pillow. It will make it next to impossible to work on a laptop or really do any sort of significant busy work. Depending on your size, it may also interfere with neighbors if you are in a cramped space. The build quality is not bad but you need to take extra care to ensure that you don’t scratch or puncture this product. Unlike other styles of travel pillows such as memory foam, even a small open cut will cause this product to deflate and become essentially useless. Also, you will be required to air it up. With a pump, this is a breeze but if you don’t happen to carry an air pump around with you, you will be stuck blowing it up with your own breath. The styling here certainly isn’t for everyone and many people likely have never seen a travel pillow that looks like this. There isn’t much flexibility in color choices so you are stuck with a handful (at most) of colors. To some, this may be an issue but to others, it is easy to ignore. 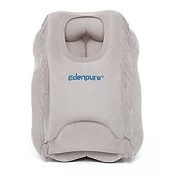 The asking price of the Edenpure travel pillow is extremely competitive. That being said, we have found other companies selling essentially the same product (such as Comroll) for slightly less. If you are on a very tight budget, we encourage you to check out the various brands that we have reviewed that offer this style of pillow and go with the one that is most affordable to you. That being said, all are very reasonably priced. The Edenpure travel pillow is another product that utilizes the increasingly popular box style design where you basically hug the product and stick your face in it. While it does look a bit awkward to an outsider, it is very comfortable. You don’t get quite the response to the padding that you may in a memory foam pillow but the added benefit of displacing heat, being easy to store when deflated, and being very affordable makes up for it. These can be hit-or-miss depending on the person but, for the most part, they have been met with great praise. Since these types of travel pillows use air, they will have a noticeably different feel and texture to them than memory foam, beads, or down padding. They are quite rigid and provide excellent support which is great for those who have sensitive necks. They also stay quite cool during use. The rubber used is layered with a PFC flocking that is comfortable to the touch but not quite as luxurious as what you will find on some of the more traditional types of travel pillows. Similar to the other brands that offer this type of pillow, you will need to have plenty of space in front of you to properly use this as it will take up your entire lap. Because of this, you will be limited in what all you can do. When deflated, however, it is a totally different story. It can be folded and tucked away easily and even comes with a small travel bag. Build quality is fine but you need to be extra careful to avoid exposing it to sharp objects. In our opinion, these really aren’t very “pretty”. They more resemble a mutated pillow that your dog got ahold of! You also look pretty silly while using it but for those who don’t mind some funny looks, the benefits are worth it. We do wish there were some more color choices as well. The asking price, while still fair, is noticeably higher than several other brands that offer this exact same product. Our only guess for why FAMY has a higher asking price is because of their branding. But as far as we can tell the other models work just as well. 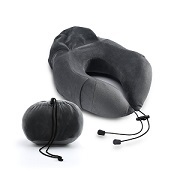 The FAMY travel pillow is another popular example of the box-style inflatable design. These types of pillows have become more and more popular thanks to how well they work and operate. This one is no exception and meets all of our requirements. However, our major gripe is with the price. While it is still reasonable, it is noticeably higher than similar pillows by other brands such as Edenpure and Comroll. We feel that FAMY should drop the price some to better-compete. We really appreciate the number of configurations that you can manipulate the Flexi travel pillow into. While a vast majority of the pillows we have reviewed focus on your neck and head area, you can actually use this pillow for your lower back and sides as well. As for the micro-beads: they are comfortable but they don’t provide nearly the level of support that other types of stuffing do. This may end up being an issue if you are after something that is more rigid and can better sustain your head from tipping down when you fall asleep. Also, the Flexi sleep pillow is quite large and if you have a smaller neck you may find yourself straining some to fit it in between your head and shoulders. Despite it being lightweight, this product actually takes up quite a bit of space. It is much larger and wider than most traditional travel pillows. Also, since you can’t deflate it or even really compress it, you will have to plan to have a decent sized storage area to put it when not in use (thankfully it does come with a carrying bag). The craftsmanship and build quality are fine. The fabric used is plenty tough and the stitching seems to be up to par. Also, it is easy to clean by unzipping the outer case and hand-washing it. There are a few different color choices which are nice. Basically, the Flexi travel pillow looks like an extra squishy oversized traditional U-shaped pillow. So if you are fine with the looks of those types of products, you will be fine with this one (albeit a bit larger). The Flexi is very affordable and is basically the same price as many other U and donut pillows. However, the added size and configurations make this a better buy than those types of products, assuming you are content with the level of support and pressure feedback that this microbead design brings to the table. 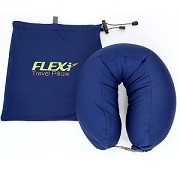 The Flexi travel pillow is certainly a unique addition to the ever-growing pillow world. The ability to transform itself into multiple styles of a pillow is certainly welcome and makes it a lot more versatile than most. The texture and feel are hit or miss, however, and some people will be disappointed with its lack of rigidity. As long as you are fine with how it feels, the build quality and asking price are more than acceptable and makes this pillow a worthy candidate. 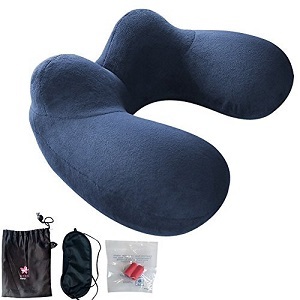 Whether or not this travel pillow is comfortable is really up to the individual and we have seen people be quite torn on the inflated designs. On the positive side, you have a product that doesn’t retain a lot of heat (which is a common issue with memory foam) and you can also somewhat adjust the softness levels by inflating or deflating air as necessary. That being said, you won’t achieve the level of softness and contouring ability that memory foams, beads, and stuffing can simply because all you have to work with is air. Also, some people feel that, when inflated, the FMAB pillow is too large and causes your head and neck to be perched outward in too aggressive of a position. The outside fabric feels nice, however. A big positive of the “balloon” design is that, when deflated, this type of pillow takes up essentially no space at all. This makes it very tempting for trips where you will be limited on storage space such as airplanes. It is also very lightweight, both when inflated and deflated. When inflated, it will take up about as much room as your typical neck pillow. The only issue with ease of use comes from the fact that you will have to air it up yourself. There are some issues with build quality as well. There have been several reports of this product tearing and deflating very shortly after purchase. The issue with inflatable travel pillows is that when they deflate, they are essentially useless. There aren’t very many color choices to pick from but the styling of this product will certainly make it stand out. Some people might crack up when they see the shape of it and automatically think of a certain part of the human body but when in use, most passersby’s won’t notice. This is an extremely affordable product and among the cheapest travel pillows you will find anywhere. This does come at a cost of not having an actual stuffing or foam for the internal material and the construction and outside walls are a bit cheap. But it does come with a carrying case, ear plugs, and an eye mask on top of the pillow. To get all of this for such a low asking price makes it much easier to overlook some quality issues. The FMAB travel pillow takes a unique approach to their extremely lightweight, simple, and cost-effective design. Resembling more of a balloon than a pillow, the inflated core will be a hit or a miss depending on the person. There are some concerns with craftsmanship and materials used but the price point is so attractive that it may be possible to overlook the glaring problems by someone on a very tight budget. Whether or not the Homca travel pillow (or more generally, inflatable pillows) will work for you really comes down to personal preference. Having air as the padding is a real hit or miss depending on who you ask. 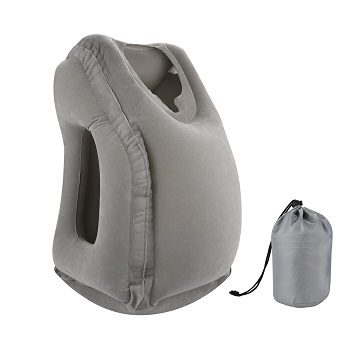 When inflated fully, this product provides excellent body and neck support but won’t be as soft and gentle as most memory foam or bead pillows. Also, you are limited in what sort of movement you can perform when using it. Finally, smaller people may struggle to comfortably use this pillow as it has a pretty set target body size and if you happen to be smaller (or even larger) than this target then it will be extremely frustrating to use. When deflated, the Homca body pillow is nothing more than a flap of fabric. It is easily stored and even comes with a handy carrying case to tuck it away into. When inflated, it is a whole different story. This product will take up your entire lap and might even protrude into your neighbor’s personal space. As mentioned above, you will also be unable to really perform any other actions such as working on your computer while using it. In terms of build quality, the material is a bit thin and prone to the same major issue that all inflatable pillows suffer from: being deflated due to scratches or punctures. If you are able to be gentle with this product and avoid sharp edges then it should be fine. And it goes without saying, but you will be required to inflate this pillow yourself. These are large, bulky, and somewhat awkward looking pillows. It has nothing to do with Homca’s product personally but rather simply how this style of pillow looks. There are two different color choices available but neither really takes away from the very “interesting” posture you will be in while using this pillow. The cost to enjoy this product is very competitive and among the budget offerings out there. This is pretty standard for inflated pillows as the materials needed are very limited (basically just the shell). It also comes with an eye mask and carrying case which makes this pillow a very good value. The Homca travel pillow doesn’t do anything new or groundbreaking compared to the other inflatable body pillows we have come across. In fact, we wouldn’t be surprised if some of these companies imported their products from the same source! The level of comfort is very subjective as some people enjoy this type of pillow and some despise is. The build quality is fine as long as you avoid sharp corners and the asking price is plenty attractive. We have discussed this design of pillow many times and they are all essentially the same. To summarize: they are inflated using air which may be a plus to some people and a negative to others. 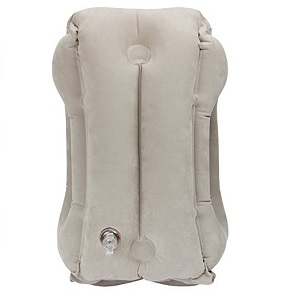 Compared to foam padding, this will be a much firmer experience and resemble a pool toy more than a pillow. For someone after good, strong support for their neck and lower back this is a good thing but for someone after a more plush experience, you may be a bit disappointed. The other issue is with sizing. If you are quite large or quite small, the precut holes designed for your arms and face may not line up properly. Finally, some people are turned off by the rubber smell that these put out. One of the big positives that make this type of travel pillow sell so well is in their portability when not in use. You don’t have to worry about collapsing the stuffing because there is none! Simply deflate out the air and you have something that can easily be tucked away in any small bag. This product also comes with a carrying case. The construction is quite bare-bones and there have been reports of seams forming over time. This is simply the price you often have to pay for a product that is so affordable. We aren’t huge fans of this style and you will likely get some funny looks by passengers nearby. Whether or not that is a deal breaker is up to you. One thing we have noticed about this style of travel pillow is that there are typically very few color choices and that is also the case here. We wish some brands would come out with some more unique colors to help them stand out from the crowd. While nearly every inflated body pillow we have seen in this style is very affordable, Homca manages to drive the price down even further. The result is an extremely affordable product that just about everybody should be able to fit into their budget. The great asking price also makes it easier to overlook some of the inherent issues and shortcomings with this design. While the inflatable body pillow style isn’t for everybody, if you happen to be someone who prefers this design then Homca makes a strong case for you to give them a try. The build quality and performance are the norms compared to the competition but their asking price is at the very bottom and well into the ultra-budget tier. The extremely low cost is also a good incentive to try out this style of a pillow with this particular brand because if you don’t happen to like it, it isn’t a huge financial burden on you. We love how comfortable this product is. 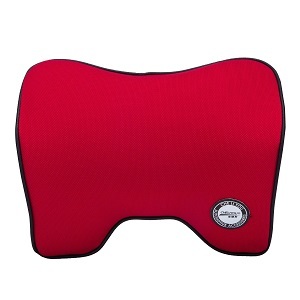 The microfiber filling is lightweight and collapsible yet firm enough to hold up your head during a flight or trip. It accomplishes both of these feats by being able to become significantly firmer when pressure is applied. This means that when your head or neck naturally puts greater pressure in a particular area, the pillow responds by providing additional support. It is also plenty flexible and can accommodate just about any shape or size of a person. Some people even prefer to use it is a non-conventional manner by stretching it out and using it is a sort of body pillow. Finally, the bamboo fabric is very soft and feels higher quality than many other types of fabric. All in all, we are very impressed. Due to the size and inability to be collapsed, the Huzi travel pillow is a bit on the larger side. Don’t plan to be able to store this away in your purse or small bag like you can with many other types of body pillows. There isn’t even really a carrying case for this, but rather a simple strap that you can wrap around it after folding, if necessary. The construction is very high-quality and the fabrics used are plenty tough and even washing machine-friendly. The stitches seem to be strong and plentiful and shouldn’t have to worry about them unraveling prematurely. The Huzi travel pillow has simple but elegant styling. It is one of the few pillows that, at first glance, don’t immediately appear to be a pillow. Rather, it looks like some sort of oversized turtleneck! This helps to make it much less of an eyesore while using. And that bamboo fabric gives off a feel of high-quality (particularly compared to some of the gimmicky fuzz-like padding that some other brands use). There are also two different color choices: navy and grey. The major con with the Huzi pillow is in its asking price. It is in the premium price bracket for pillows. Thankfully, even the most expensive pillows should still be obtainable by most people due to their somewhat limited ceiling. And you do get to enjoy a noticeable bump up in build quality and materials that we feel is well worth it. 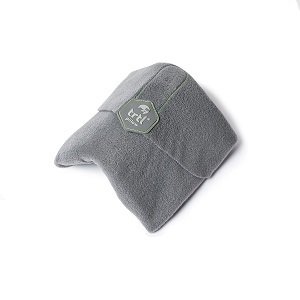 The Huzi travel pillow is one of our favorite products we have had the chance to enjoy. Their approach is not only unique but really works. The microbeads and gentle bamboo fabric work harmoniously together and result in a very comfortable and accommodating pillow that people of all sizes and sleep patterns will enjoy. The asking price is a bit higher, but the craftsmanship and overall user experience make it well worth it. We encourage that you try this product out if you are after a new pillow for your airplane or bus trips. The J Pillow is extremely comfortable and supporting if you have it set up in the correct configuration. The problem is that the correct configuration may not be popular in many applications. It really requires a wall or flat area to your side that you can lean into. If you are in the middle aisle seat or sitting on a computer chair, it won’t be able to properly hold up on your neck and is likely to fall off. If you do happen to be near a wall and can fully utilize its design, the J Pillow will provide good neck and head support without being too restricting. The stuffing is also quite comfortable and doesn’t get nearly as hot as memory foam. 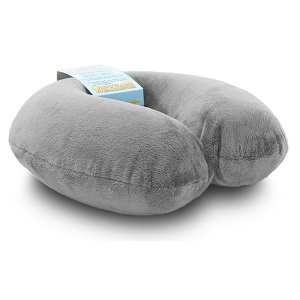 This product is a bit on the large side but the company states that its shape and stuffing allows it to be stuffed down to be more compact than most U-shaped pillows. We have tested this theory and frankly, we didn’t see enough difference between the two to make it worth noting. Simply put, you may struggle to stick this in a small bag but it isn’t so large as to be burdensome. Also, a majority of the pillow is on one side of you so if you are in cramped conditions the pillow may jut out close to the person sitting next to you. However, you can enjoy it while having your hands freed up which is nice. Build quality is very good and the stitching is excellent. Because of this, J Pillow proudly states that you can wash the entire product without issue. This certainly is a very original design and does actually resemble a giant J. Even funnier, when using it almost looks like you have a small fluffy blue man hugging you from the side! You are likely to get some funny looks and interesting questions while using this product but there are more out of curiosity than poking fun at you. We also wish that there were a few more color choices and perhaps a carrying bag. This is a bit higher on the price scale than your typical U-shaped or donut-shaped travel pillows. However, the design is not ordinary and we are pretty sure that the company that designed this pillow has some sort of patent on it which means that you are limited on who you can buy it from (which also drives up the price). That being said, you do get to enjoy some unique benefits (and challenges) with this product that you won’t find anywhere else. 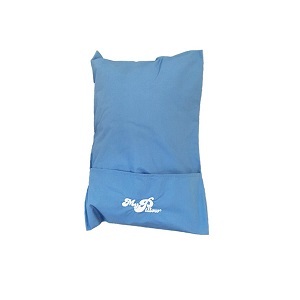 The J Pillow is a great performing pillow if you happen to be in the specific situations that call for it. Being near a wall or other flat vertical area is almost a necessity. If you can find out, the level of comfort and shape of the J Pillow is awesome and you should find yourself very comfortable with great support on your neck and shoulders. But if you don’t have a wall to utilize, your head will droop and the pillow is even prone to fall off from the side. The build quality is plenty nice and the materials used are acceptable as well but it does come with a higher asking price to enjoy it. Overall, we feel like it is worth checking out if you always book the window seat of a flight or bus. We have all seen this type of product before and JUNING really doesn’t do anything to take away from it. The combination of the dense memory foam, nice fabric, and optimal design means that you should enjoy the stability and structure of this pillow no matter your neck size. The only issue we had is those with shorter necks. The pillow is a bit on the larger size and, while the memory foam will compress, it is a bit denser so you may end up feeling like your head is being forced up more than you would prefer. But this issue is definitely in the minority. Also, despite using memory foam, you shouldn’t get too warm using this pillow. The combination of dense memory foam and being a bit larger in size than many other U-shaped travel pillows on the market means that you will need a bit more storage space for this. Furthermore, it doesn’t come with any sort of carrying case so being able to compress it doesn’t really do much good as you will still need to find some sort of bag or container to stick it in to stop it from expanding back out to its natural shape and size. The construction is reasonable and the stitching isn’t bad. It is designed to be machine washable but we would try to minimize how often you have to do that or else the pillowcase may start fraying. This is a very safe and popular design and you should blend right in on any airplane flight or bus ride. In fact, we would argue that the JUNING travel pillow actually looks above average as the external material is quite nice and plush and resembles something you might find on a higher-end blanket for your bed. We only see one color choice, however (which is a bit disappointing). The asking price here is extremely competitive and falls well into the ultra-budget tier. Despite being very reasonably priced, the performance and build quality are perfectly acceptable. This is a very good “bang for the buck” neck pillow. For those that prefer to keep things simple, the JUNING travel pillow sticks to a proven formula in its shape and stuffing. The memory foam they use is quite nice and the fabric that the pillowcase is comprised of is surprisingly luxurious. There are some minor sizing and storage issues as this is a bit larger of a U-shape designed pillow and there isn’t a carrying case but, for the great asking price, they are easily overlooked. This is a solid purchase. For those that enjoy the stability and comfort of traditional donut-shaped travel pillows, you will love with Kingta has brought to the table here. While sticking to the standard shape, the curves are more contoured and do a better job of hugging your neck. 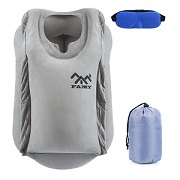 The memory foam used is also plenty dense and provides good support even for those with heavier necks and heads. The cover is made of fluffy velour that is always a crowd favorite. For a bit of adjustability, there is also an adjustable strap built into the base that allows you to alter the overall dimensions and hugging diameter to meet your specific needs. Kingta has done something really unique here and actually sewn on the carrying case directly to the back of the pillow. This allows you to simply compress the pillow and push it up and through the carrying bag. We absolutely love this feature as it means that you don’t have to worry about keeping up with the bag (which is almost always separate from the pillow). The foam is also easily compressed so you shouldn’t have to struggle with getting the neck pillow small enough to fit into its bag. The build quality here is very good as well. The stitching is on point and not rushed and all of the materials seem to be in good order. The styling cues here are subtle but modern. The curves of the pillow are a bit more aggressive than traditional U-shaped pillows (which are often more round in shape) but it still closely resembles its predecessors. Having the bag sewn onto the back of the pillow isn’t helping it any in the looks department but the sheer convenience of having this feature more than overlooks minor aesthetic complaints. There are also a lot more colors to choose (4 in total) from than many of the competitors out there. You will pay a bit higher of a price tag for the Kingta travel pillow than most of your other typical memory foam pillows. But the combination of comfort, usability, and convenience is well worth it. The competition for the best U-shaped travel pillow can be a bit stale but Kingta has managed to find a way to spice things up while still sticking to its roots. This product performs better than most other pillows out there and does so while being extremely convenient for the person using it. While it isn’t the cheapest, we encourage everyone to spend a bit extra and enjoy this awesome pillow and its many benefits. If you are someone who likes to burrow into and embrace pillows to fall asleep then you may really enjoy the Koncle travel pillow. This type of pillow is designed to be accessed from the front rather rest behind your head and shoulders like most other travel pillows. The padding comes from inflating the product up with air as opposed to stuffing or beads. This does give a slightly different feel. The air is not as “soft” as most padding and can also be quite firm if you push into it. This is helpful for those who suffer from sagging heads but for someone wanting something gentler, you may be turned off. You also don’t get the plush outside fabric like you do on many traditional airplane pillows. These types of pillows are really a double-edged sword. On one end, when they are deflated, they take up very little space and can be tucked away in the included carrying case. This makes them very easy to transport. On the other end, when inflated, they are quite large and will take up all of your lap space. This means that you won’t be able to do any other tasks such as work on your laptop. You are also required to air it up yourself. From a manufacturing perspective, these are somewhat delicate products and if you accidentally puncture it, all of the air will escape and the product will be ruined. As long as you avoid sharp edges this product should be fine for several years of typical use. We have made it very clear in other reviews of similar products that we aren’t huge fans of how this type of travel pillow looks. They are large, bulky, and quite silly to see in the real world. Furthermore, there are little in the way of various colors to choose from. Looks may not be a big deal to you but we definitely consider these as one of the more unattractive solutions out there. Nearly all of these inflatable-style pillows are quite reasonably priced. This is because there isn’t a lot to them and they don’t need any sort of stuffing or padding (which can often be the most expensive component of a travel pillow). That being said, the Koncle airplane pillow is a bit more expensive than many other brands that offer essentially the same product. We really aren’t sure why they have a higher asking price. The Koncle airplane pillow sticks to a proven and popular style in their large inflated product. Comfort levels can be subjective but just about everybody will agree that this design provides plenty of support for your head and neck. We aren’t a big fan of the styling and the asking price is a bit higher for some reason, but if you are into this style of pillow then the Koncle brand will do the trick just fine. LIANSING travel pillows are inflatable pillows but are totally different than the large inflatable pillows we have reviewed that you essentially “hug”. Rather, their product looks similar to a more traditional pillow that rests behind your neck. Despite being a different approach, our thoughts on inflatable pillows remain the same: you really need to try one out and see if it is a good fit for your individual needs. Inflatable pillows will be much firmer and less “gooey” as a conventional memory foam or even microbead pillow. For people who want good support and stability for their neck, that might be a good thing. However, for those who prefer something that is softer and contours better, you may be disappointed. The definite positive is that inflatable pillows typically don’t get nearly as hot as foam pillows. But we do wish that there were some cords or strings that allowed you to tighten and loosen the pillow around your neck. This pillow is extremely portable. Not only because the inflated size has about average dimensions but also because you can deflate it so that it takes up essentially no volume at all. Furthermore, there is an included carrying case that allows you to easily stow it away for later use. This is one of the few travel pillows that are truly small enough to fit in a typical purse without issue. The build quality is about average. You won’t find any glaring manufacturing flaws but the concern is that if you do accidentally puncture this pillow then it will not hold air and be completely useless. So be extra careful around sharp edges and points when using this pillow. Despite being inflatable, the styling of the LIANSING airplane pillow is actually very similar to what you see with memory foam and microbead pillows. This is a positive to us as we don’t want our pillow to resemble a pool toy or inner tube. The outside fabric is plush enough to look nice and the air nozzle is well hidden underneath. There are also two color options (blue and brown). Considering that you get two of everything in this package, the asking price is extremely competitive. This is likely because of two things: first, the fact that you are buying a higher quantity means that you get somewhat of a “bulk discount”. Second, since this is an inflatable travel pillow (and a small one at that), there is little in the way of materials needed which drives down the manufacturing cost. The LIANSING travel pillow takes a somewhat specialized approach by doing an inflatable pillow but in a much smaller package than most others. Furthermore, it comes in a 2-pack which adds to the savings since you are buying in bulk. Being an inflatable pillow, you will have increased firmness at the cost of a little less softness. So it will really boil down to the individual as to whether this is a good thing or a bad thing. One thing is for certain, however: this pillow should fit in just about everybody’s budget. Inflatable pillows are much firmer than pillows with stuffing and this may be good for some people and a turnoff for others. The increased firmness is due to the air compressing but not having anywhere to escape. So the more pressure you apply to an area, the harder it is going to become. For people who are after nothing more than some good neck and head support, this increased firmness will be welcome. But for people who would prefer something that has a more pillow-like feel, you may prefer the advantages that a conventional foam neck pillow provides. As you might expect, the MLVOC travel pillow is extremely easy to transport thanks to its small size and ability to deflate. When deflated, it fits easily into its included carrying case and can be tucked away in any purse or bag. Even with inflated, it will take up only marginal volume and should not distract your neighbors next to you. Build quality is fine with this unit except that you need to be cautious around sharp objects because a punctured inflated pillow is nothing more than some flat rubber! The styling is very safe and standard. Many people will not realize that this is an inflatable pillow and will instead think it is your typical stuffed example. We personally prefer low-key designs for travel pillows so this is a nice bonus for us (considering how large and noticeable many of the inflatable hug-style pillows are). We also have to give this brand some bonus points in the styling department as they offer their product in multiple colors (blue, grey, and khaki). These are extremely affordable products and should be within everybody’s budget. Not only do you receive the airplane pillow but you also get earplugs, an eye mask, and a carrying case. There isn’t a lot to constructing these which explains the great price. The MLVOC travel pillow is another miniature inflatable example that is very popular in the online marketplace. Using air instead of stuffing, this product is firm and doesn’t have the level of softness that pillows with other types of stuffing will have. However, it does come at an extremely affordable price that includes some helpful accessories as well. Overall, it isn’t a terrible option. The memory foam insert used in the My Perfect Dreams airplane pillow is very responsive and in the middle to upper tier in terms of firmness when compared to other memory foam examples. This is great for those who enjoy a firm support like you find in inflatable pillows but still want a bit of the response that is normal in foam examples. The neck of the pillow, while not adjustable via a string or rope, can be bent to fit most neck sizes manually. There isn’t a carrying case that comes with this product which we were a bit disappointed in. Rather, it has an attached loop that is intended for you to hang from your bag or other items that you bring on the plane. While we do appreciate that the loop was included, we wish that they would design it so that it could be tucked away in a bag and put inside. Being memory foam, you can compress it quite a bit to take up less volume but without anything restricted to store it in, it will ultimately form back into its original shape. The build quality is above average and a very nice aspect worth noting is My Perfect Dreams’ 10-year warranty on this product. This warranty is much longer than just about any other brand we have come across and it speaks highly for the level of quality that this pillow possesses. This is about as straightforward of a design as you can get. There are no real noticeable features outside of the attached loop. We don’t’ mind this approach but do wish that there were some more color choices available. For being a memory foam-based pillow, the asking price is very reasonable. Typically, memory foam products run a bit higher since memory foam can be expensive but My Perfect Dreams is able to keep the costs down which is likely a big reason why this product is as popular as it is. The My Perfect Dreams travel pillow takes a very safe and proven approach with their memory foam pillow. It follows a standard U-Shape design and utilizes a firm but forgiving foam as the core. We do like the inclusion of the loop for help in transporting but wish that there would also be a carrying case for those that prefer to tuck this pillow away in a bag vs. hanging it from their suitcase. A big positive is the awesome 10-year warranty that this comes with along with the respectable asking price. This product is worth checking out due to the warranty alone. MyPillow Inc manages to make a pillow that is extremely comfortable to use. Its softness is thanks to the patented 3-piece interlocking fill that it is stuffed with. This specialized fill allows you to adjust the pillow without it losing its shape. In addition, it helps to keep the pillow much cooler to the touch when compared to traditional foam pillows. It is worth noting, however, that this pillow won’t provide nearly the level of neck and head support for this sitting in an upright position on a plane. The fill is very soft and there is also no mechanism to keep it centered on your neck so you will find that your head will likely droop if you are in the middle seat or if you tend to move around a lot in your sleep. For being a traditionally shaped pillow, the portability is very nice here. The patented fill really shines in that you can roll the pillow up into a small tube and stuff it away in the included carrying case. It will take up more room than most conventional travel pillows, however. Don’t go in expecting to be able to stick this in a small purse or bag nearly as easily as many of the small, inflatable products we have gone over. As for build quality, it is excellent. The components used are very high quality and can hold up to typical wear and tear with ease. In addition, it is easily washable and dryable which we always like to see. This is one of the few pillows that actually LOOKS like a pillow, so for those after a traditional look then this will hit right at home. Furthermore, there are tons of color choices and even some examples of patterns such as cheetahs and camo. The sheer number of different color options trumps just about any other model we have looked at. This gives MyPillow Inc huge bonus points in our book. The asking price for this particular airplane pillow is a bit higher than most and falls into the premium price category. However, it still isn’t all that expensive and should be within most people’s budget. For the combination of quality components as well as emulating a real pillow, the asking price is more than fair. We really like that MyPillow Inc decided to take a somewhat different approach and try to tackle the travel pillow dilemma by offering what looks like a typical pillow. While this does introduce some issues such as having enough firmness and neck support, it does also result in an extremely soft and comfortable pillow if you can orient your head in a way to take advantage of it. All of the components are well-made and the fact that you can roll it up and stick it in the included storage case does give you a sense of portability that most normal pillows are sorely missing. While the asking price is a bit higher than most, we feel it is justified after seeing the product you receive. This pillow is designed to be a completely immersive experience. Rather then simply providing padded support, it also covers your eyes and a lot of your exposed face to basically shut you off from the rest of the world. It is stuffed with microbeads and the outside is composed of 95% viscose and 5% elastomer. All in all, the result is quite comfy but is lacking enough firmness to adequately prop your head and neck up. It is fine for resting your head on a top or wall but in many cases while on airplane flights you don’t have anywhere to rest your head and having something that can freely support it is important. Also, we do wish that there would be some more microbeads inside. While the ones in there are soft, adding some more would increase the contour levels and also provide some additional much-needed padding. This is a rather large and bulky product that doesn’t have any sort of recognizable way to compactly store and transport it. The beads don’t really compress like memory foam does and you can’t deflate it as you can in most air-filled travel pillows. You will need to dedicate a significant chunk of your bag or suitcase in order to put this away. That being said, the construction is quite good and all of the components from the microbeads to the outside material to the stitching is top-notch (it better be for this price!). You can expect this product to last for a long time before fabric begins to fray. We aren’t going to beat around the bush: this thing looks absolutely ridiculous. You will look like a blend of an earthworm and a hammerhead shark while using it and are sure to get some odd looks from strangers walking by. 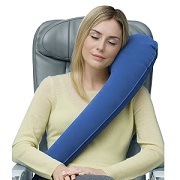 There are a few different color schemes to choose from but none of them take away from the fact that this is an extremely odd looking travel pillow. The Ostrich travel pillow is astronomically expensive compared to nearly every other travel pillow we have reviewed. It is multiple factors higher than probably 90% of them and easily tops the premium category. You do get quality construction but beyond that, we really question how they can justify such a high asking price. The Ostrich travel pillow certainly wins some points for originality but overall the design and implementation falls a bit short. While the padding and fabric are comfortable, they are lacking in a support structure which is essential for a travel pillow. Furthermore, the whole styling concept is pretty silly. And for the extremely high asking price, we expect much better. This is one of the most comfortable travel pillows that we have tested. The memory foam that is used is quite thick yet still gives when adequate pressure is applied. We also really like the overall shape of the pillow as it really goes well with the contours of the human face and neck. You can easily adjust the tightness of the pillow with the wide band of velcro on the inside. The fabric that is used is very soft and reminds us of a premium cotton shirt. With the tapered front, you can also manage to look down in order to read a magazine or book. The only minor issue we have is that for those who are warm-natured, you may find that thick memory foam and fabric are a bit too warm on your neck. However, since these types of pillows are primarily used on airplanes where it is cold, this shouldn’t be an issue for most people. The OstrichPillow Go Travel Pillow comes in an attractive carrying case that you can easily fit in any normal sized backpack. When removed from the case, it is slightly above average in size but can easily be compressed down to a smaller volume thanks to the responsive memory foam. The build quality of the pillow is excellent: simply holding it, you can feel that it is made of great materials and has excellent stitching. In addition, the outer sleeve is machine wash friendly. One of our issues with the traditional Ostrich Pillow is its looks. This pillow corrects many of those problems and is something that you won’t be embarrassed to wear in public settings. The gray/black finish is also quite nice and gives off a sense of quality without being overly ostentatious. And the overall packaging is some of the best that we have seen. It even comes with a handy carrying case. This is still one of the more expensive travel pillows on the market. For those on a tight budget, it may be a bit more than you want to spend. However, we feel that the improved build quality and comfort justify the high price tag. This is a quality pillow that should last much longer than many of your cheaper alternatives and also be more comfortable in the process. 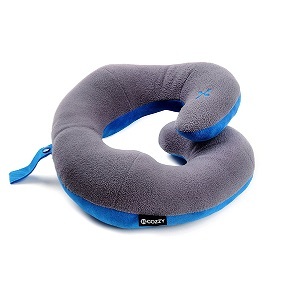 We are very impressed with the OstrichPillow Go Travel Pillow. It utilizes very comfortable memory foam and packages it in a way that is much more visually appealing than the traditional Ostrich Pillow. Also, the build quality and packaging is among some of the best that we have seen. It is still pretty expensive. However, we feel that you will be happy that you spent a bit extra for a superior product that will last much longer. The microbeads that Pack4track uses are very good and, despite being lightweight, do a good job of creating a comfortable product. You don’t get quite the squishiness that you do with foam but it is arguably better than with air and many other types of stuffing that are common in travel pillows. The firmness can be adjusted primarily by tightening or loosening the strap. If you tighten it up, the microbeads are sort of “squeezed” together and firm a rather strong and firm support. If you prefer more fluidity then simply loosen the strap some to have more of a traditional pillow feel. There is a cotton material that is used on the outside of the pillow. While it isn’t as plush and luxurious as some other materials we have come across, it does the job just fine. The major issue with microbead neck pillows is that they cannot be compressed as much as foam and obviously air. This does mean you will need a bit more room to store and carry this product. In fact, Pack4track displays an image of carrying it on the top of your bag rather inside it. This is further proof that this product really isn’t meant to be stuffed away in some small crevice. However, it does come with a nice carrying case and, combined with the included ear plugs and eye mask, make for a very nice package. The build quality is very good as well. Just holding the Pack4track travel pillow, you can tell that it is made of quality components and shortcuts weren’t made in the construction of it. The styling of this pillow is simple yet effective. It comes in a standard white color but the built-in adjustable strap is grey and helps to make the whole product pop out a bit more. Even more impressive is how well all of the parts come together to make a set. Even the earplugs have a really attractive case that they come in. It is obvious that Pack4track is trying to make up for the lack of mobility by making it a more attractive final product (since you will likely have to keep it outside of your bag while traveling). The cost for this travel pillow is a bit higher than most other microbead examples of similar size. However, it does come with added components and features that many other similar pillows don’t have. This is likely why Pack4track is asking a higher asking price. Overall, it is still an acceptable value. Utilizing a very popular approach, Pack4track is able to stick out some by adding their own twists including a helpful adjustable strap and various other components to make sort of a total package. The comfort levels are adequate and, while you don’t have quite the mobility of most travel pillows, the carrying case is a nice touch. You will pay a bit more for this but, in our opinion, it is well worth it. The utilization of this particular neck pillow is a lot different than anything else we have reviewed so far. If you go in looking for a soft and squishy pillow to buy, you may be disappointed. This neck pillow doesn’t have the internal shell loaded with foam, beads, etc. like most other products. However, if you are simply after something that is comfortable and that will keep your head upright on a long flight then look no further. Made of double paralon and held together with Velcro, this product does an excellent job of handling heavy heads and necks and keeping them upright. Furthermore, it does so while still being comfortable and not straining. Overall, the product hugs the neck very tightly and will stay in place even when you move your head around. This is a great product if that is specifically what you are looking for. The simplicity of this design means that there aren’t really any weak points. While potential punctures or cuts could spell disaster for air or bead-based pillows, there is no concern of that here. The fabric is high quality and can handle plenty of wear and tear. It is even washing machine-friendly. This is important because the product functions around being able to handle tensile forces. Also, the Velcro used is thick and nice quality and will get a good bite time and time again. In regards to portability, the fact that there isn’t any sort of stuffing means that this product is very easy to stow away in any small bag or purse. It is also very lightweight which is always a good thing. If you prefer an inconspicuous design then this travel pillow is just for you. You can wear it comfortably and without diverting a lot of attention to yourself from nearby passengers. 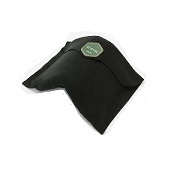 In fact, the product almost looks more like a turtleneck than a pillow. There is only one color choice that we have seen but other than that minor complaint, we approve of the styling. For being a relatively simple design, the Parvbo Outdoor neck pillow is somewhat pricey. It doesn’t have any expensive memory foam inserts or exotic materials and other than that Velcro strap, it is essentially some fabric and light padding. Perhaps this brand has a patent on this design as we haven’t seen it anywhere else and that is why they charge more. Either way, it does the job and does it well: just expect to pay a bit more for it. We really enjoyed the Parvbo Outdoor travel pillow. It takes a very refreshing approach to travel pillow design by honing in on one of the most common issues with traveling: neck pain from dropping heads and shoulders. The design allows for great head and neck support and helps to alleviate any neck strains. While it doesn’t have the soft and comfy consistency of memory foam pillows, it is still very comfortable. And because of the design, portability and toughness are great. You will pay a bit more to enjoy this pillow but it is well worth it and one of our top choices. This is a rather firm sleep pillow and not nearly as soft as many foam-based products are. While there is some give, it immediately pops back into place. Think of how an inflated animal or pool toy feels. That is basically what you are working with here. The unique design is one of Royal Limits’ top selling points it seems. Basically, the extra-long base allows you to “hug” the pillow. But, being so firm, it really doesn’t huge you back. Rather you are just holding it. While we appreciate trying to think outside of the box, we don’t really see a use for the longer base piece. 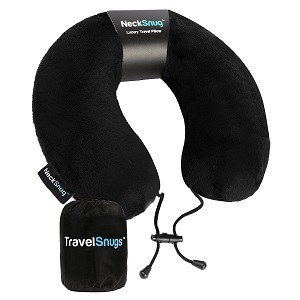 More importantly, we are concern about it being able to adequately stabilize your neck during long flights. Overall, it really doesn’t do a good job. The pillow has a tendency to fall off from around your neck. And even if it doesn’t, unless you have an extremely thick neck, it doesn’t really wrap around and your neck can still dip inside of it. This is a large product and, when inflated, will take up quite a bit of space. The fact that it does take up so much space means that you will have difficulty doing much in your lap while using. Also, due to its length, it may get in the way of neighbors sitting next to you. The good thing is that it is inflatable and, when deflated, can be tucked away much easier. The problem is that you then have to blow it back up! There is an air valve that makes the process much quicker but still. The build quality is acceptable but the major issue with inflatable sleep pillows as that any puncture or opening spells disaster. And since this is such a large product, there are lots of places where a small hole or cut could form, rendering the pillow useless. We aren’t a big fan of how ostentatious this product is. It is large and awkwardly shaped and sticks out like a sore thumb on an airplane. In addition, there is only one color option that we have come across. The asking price, given the size, is pretty good. You get a lot of “pillow for the buck”. The problem is that many people won’t find it very comfortable or useful. Also, we typically expect inflatable pillows to run cheaper since they don’t require stuffing. The Royal Limits travel pillow certainly is unique in its approach but we feel that there is too much gimmick and not enough viable application. The inflatable shell just isn’t that soft and the curved portion doesn’t have an easy way to adequately wrap around your neck and stay. The belt clip, while clever, just doesn’t seem like it would serve much of a purpose sometime. The asking price is decent but we just don’t see enough usefulness to suggest this is a great buy. Since this is an air pillow, it will be a bit on the firmer side. While this may be hit or miss in traditional pillows, for an ottoman-style pillow that you rest your legs on, you probably want it firmer. Also, things such as soft padding aren’t as important here. We must say that it is a nice addition to a flight. Being able to lift your legs up is quite nice. The problem is space. Many flights (particularly smaller planes in economy seating) may not have enough space to squeeze this pillow up in between your seat and the seat in front of you. In those flights, you wouldn’t get any added comfort because you can’t even use it! Also, it is important to remember that you will have to inflate this somewhat large “balloon” before you can even use it. As we mentioned above, portability, when inflated, can be a major issue here. Assuming you can actually fit in underneath you, it is fine. Also, you won’t have anything occupying your lap space which allows you to read a book/work on your computer/etc. The problem, of course, is that you may still need a neck pillow on top of this. When deflated, this product is easy to store away. While it is a bit larger than most other inflatable travel pillows, when it is deflated you can fold it up which takes care of most of the volume issues. Build quality is decent but you have to be very careful to make sure that it doesn’t rub against any sharp surfaces around the base of your seat or near any luggage that is on the floor. This can puncture the product and make it useless. The Simptech travel pillow looks more or less like an inflatable box. While it isn’t the most attractive thing in the world, it will be underneath your feet so being an eyesore isn’t really that important. There is a single color choice. The cost of this pillow is a bit higher than most other inflatable pillows on the market. It is a unique approach and most of the other air pillows we have reviewed are the body types that you hug. This example is larger than those and more material = more cost. However, even if you use this, you may still need to buy a traditional neck pillow which means you will have to spend even more. While the Simptech travel pillow takes a very refreshing approach and focuses on your legs and feet instead of head and neck, there are too many “what ifs” to make it a strong recommendation. You may not have room in between your seat to use it and you will also likely still need another pillow to support your upper body. And considering the higher than average asking price, it is not worth it in most cases in our opinion. The Travelmate travel pillow utilizes standard memory foam. While this is a popular approach that many other brands use, the Travelmate memory foam is very soft. This makes for a comfortable feel but the main concern (and a common complaint by quite a few people) is that it is TOO soft and does not provide adequate support. Sure enough, if you are a heavy sleeper and tend to droop your head a lot then you may find that this particular model is not firm enough for you. Also, there is no way to adjust how tight or loose it is on your neck. This could be frustrating for people with abnormally large or small necks. The one bright point is that it does include an adjustable insert that can adjust how far your head is pushed forward while sitting up. The size of the Travelmate neck pillow is optimal for taking up only as much space as it needs to. It is also foam so you can easily compress it which will help in storage. The attached elastic strap means that you can easily wrap it around your suitcase so that it doesn’t take up valuable space inside. The nice size means that you can comfortably wear it without disturbing your neighbor. We see no design or quality issues with this unit, either. The construction is acceptable and the fabrics and stitching are good enough quality to handle typical wear and tear for quite some time. This design is about as straightforward as you can get. 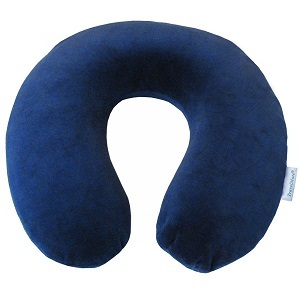 It is very safe and resembles just about every conventional neck pillow that you can think of. We do wish that there we some more color options than blue, however. As we alluded to earlier, one of the likely factors that play a part in why the Travelmate travel pillow is so popular is its fantastic asking price. This particular model manages to compete with asking prices of many inflatable neck pillows but does so while utilizing a memory foam core (which typically drives up the price more). This makes it a very tantalizing choice for someone on a tight budget but still wanting to experience memory foam. All in all, the Travelmate travel pillow takes a standard design and adds a couple of subtle features such as a removable backing and an elastic carrying strap. And it is able to offer all of this at an extremely affordable asking price. The main concern is that the foam is too soft for some and may not provide the level of neck support you are after. If you are willing to deal with a bit less support around the neck then this is a perfectly suitable choice. We must admit that having the overlap in the front does give some much-needed chin support that most U and donut-shaped neck pillows are sorely lacking. This is great for those who tend to dip their head down while sitting upright. However, the foam that is used is a bit too soft and does not provide the adequate levels of support that many people are looking for. Also, if you have a broader neck then there may not be enough overlap and this product may perform like a typical U-shape pillow. Besides those issues, the pillow is quite soft and is viable for people who don’t suffer from major head dipping issues and simply want something that is soft. The foam, while compressible, doesn’t have any sort of carrying bag. So you will have to store it in its fully-expanded form. To help with transport there are both a Velcro strap as well as a hook sewn on that allows you to hang or wrap it around a suitcase or bag. The build quality is decent and there aren’t any major issues that we have come across with construction. The one feature lacking that we really wish it had is a removable cover that is washing machine friendly. This is a very safe and popular design and despite being much longer than typical U-shaped neck pillows, it looks about the same. There is only one color to choose from, however. The asking price is a bit higher than some brands but overall falls in the middle to low premium price tier. 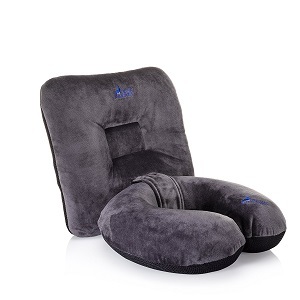 This isn’t a terrible price all considering because it does utilize foam and, being larger than most neck pillows, it requires more material in the construction process. Still, it is definitely not the cheapest option out there. The Travelon travel pillow has a rather specialized design, taking advantage of the wrapping feature common in most pillows and increasing it several inches. This creates an overlap that can greatly assist in keeping your chin and neck around straight. The issue is that it may be too soft for some people (particularly in the back region) and the lack of adjustment means those with larger necks may not enjoy it as much. That being said, it is worth checking out if you enjoy U-shaped pillows but want something with a bit more circumference. Once properly situated, the Travelrest travel pillow is incredibly comfortable. The reason we say “once properly situated” is because there is a bit of some adjustment that you have to do before you can use this product to its fullest extent. Thankfully, Travelrest has included a helpful tutorial video about how to orient the pillow for maximum comfort. When utilized properly, it gives you very good support from your side which is a bit of a rarity in this market as most other pillows are designed to support your all around and not from the side. For side-sleepers, this is a huge bonus. We recommend slightly deflating the pillow to 80 to 90% full to get a bit of an extra soft touch. As in notorious with most inflatable pillows, when fully inflated it can be a bit too firm for many people’s likings. Also, we recommend trying to put a soft layer on the pillow as the outside of the pillow, while not terrible, could use a bit of a softer touch. When inflated, this pillow will take up more space than average. However, compared to many of the “hug-style” inflatable pillows out there, it isn’t nearly as bad. You may still be able to do some work or use your hands and arms for other activities while using. It is also important to note that you may get too close for comfort to your neighbor as the top of the pillow is prone to stick out a bit. This can be avoided with some slight moving but it is still worth noting. When deflated, the Travelrest travel pillow can be easily rolled up and stored away without taking up hardly any space at all. The build quality is excellent. The materials and construction are high quality and can handle most wear and tear. While there is always a slight concern of inflatable pillows popping from being punctured, the Travelrest model is plenty thick and should be able to handle the occasional bump or poke without issue. Also, the company is awesome with customer support and will quickly work with you to resolve any quality issues. This is a rather bulky pillow and some people may not like that. However, we MUCH prefer this style to the other popular inflatable pillows that resemble huge boxes that sit on your lap. Think of this as an oversized seat belt. Another nice feature is that this particular product comes in 4 different color choices. This is among the largest selection in the industry and something we love to see. You will have to pay the premium price range for this product. Typically, these specialty designs (that are often protected by patents) fetch a higher asking price. But they do also come with some nice features and benefits that few other brands can match. So while it may cost a bit more, you get a lot more as well so we feel the asking price is justifiable. Overall, we were really happy with how well the Travelrest travel pillow performed across the board. Its side-sleeping orientation was a big hit and something that we feel many weary travelers would love to take advantage of. It does take a bit of fidgeting to get things just right but once you figure out the perfect setup for you, you will likely enjoy comfort levels that few other travel pillows can match. Sure it may cost a bit more but the great build quality, helpful customer support, and great performance make it a must buy in our opinion. TravelSnugs takes great pride in their soft memory foam core and we must say that it was quite nice. Among other pillows, we would have to rank this example towards the top in terms of comfort. The core is soft enough to be able to be manipulated to fit any sized neck and the toggle helps to make sure it stays in place. As we mentioned above, this pillow won’t be great at offering stiff neck support. Your head may still droop to the sides if you fall asleep and are a heavy sleeper. Finally, the outside fabric is extremely soft and feels great on your skin. And it also doesn’t get super warm like many other memory foam-based pillows. Everything from the core to the machine washable outer cover is high quality. The stitching is deep and thick and you shouldn’t have to worry about it becoming unfurled. Also, TravelSnugs stands behind its product and offers a full refund in the case of any sort of quality defect. The portability of this product is about average. It doesn’t take up a lot of space and is compressible but we do wish that TravelSnugs would have included a carrying case. Rather, it is designed and intended to be wrapped around your suitcase and carried outside of your bag/purse. This is a very standard and conventional style. You will see countless people wearing extremely identical travel pillows in any airport you walk into so you don’t have to worry about sticking out or getting any funny looks. It only comes in one color but the fabric is plush and it really makes this product pop out as being higher quality than many other U-shaped travel pillows you will see. You do pay a bit extra for this brand and its awesome core but it is still extremely reasonably priced and should be within everybody’s budget. When you are talking about a few dollars difference between getting a relaxing night’s sleep or tossing and turning, it really doesn’t make much of a difference in the long run. And the comfort you will feel thanks to the soft core is reason enough to spend a bit more. We were surprised at just how soft and comfortable the TravelSnugs luxury travel pillow was. We have come across plenty of memory foam cores but their product definitely stands out. The only issue some may have is that the core isn’t super firm and is not great for providing raw neck support. For those people, you may want to go with an inflatable or microbead neck pillow instead. For everyone else, the combination of great comfort, good construction, and acceptable price make this one of our top choices. In regards to the softness and performance of the pillow itself, you can expect pretty typical comfort levels. The foam is soft enough to meet most people’s needs but may fall a bit short for those who prefer an extra firm base. But then again, that really isn’t the designed intention of memory foam-based pillows anyways. The added hood is a bit gimmicky considering that you also have a sleep mask. The sleep mask will block out all outside light so we aren’t really sure what the purpose of the hood is other than perhaps it makes people feel more secure in that their head is covered up. We will admit, however, that the fabric used on both the pillow and hood is very soft and nice to the touch. But the memory foam and hood combo may become a bit warm for those people who are warm-natured. Since memory foam can’t deflate like an air pillow, we like to see brands have carrying cases that allow you to compress the pillow and store it in the case. 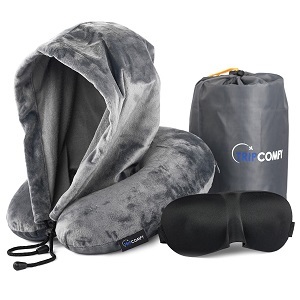 TripComfy does exactly that with their handy carrying case that can fit the pillow as well as the included hood and face mask. This makes it much easier to transport the pillow and you don’t have to hang it off or wrap it around your luggage like you do in many other designs. You also are able to take full advantage of both the travel pillow and hood without disturbing your neighbor and getting in their personal space. The construction is good although you have to be a bit gentler with the hood as it can catch sharp corners and potentially tear. And TripComfy will stand behind their product and offer a money-back guarantee in the case of any defects which is always a positive. The sewn on hood actually looks pretty professional and not as gimmicky as we would have originally thought. The total package was well thought out and you can tell that some good engineering went into it. There is only one color to choose from, however. You will have to pay a premium to enjoy the TripComfy Zen-Cradle. The fact that it has a memory foam core, added hood, face mask, and carrying case means that the overhead to produce this product is a bit higher than someone offering nothing more than a memory foam pillow. That being said, the package comes together nicely and we feel that the asking price is perfectly reasonable. Overall, we like the modifications that TripComfy made to their Zen-Cradle to make it stand out from the many other conventional travel pillows on the market. The hood is a bit gimmicky but it might be of use to some people who prefer to have a more “enclosed” environment when they sleep. It was also added quite well and doesn’t feel cheap or forced. The price you will have to pay is a bit higher but if you value the additional features it shouldn’t be too bad of a hit on your wallet. If you are looking for a soft pillow-like effect then you may be a bit surprised and disappointed with this product. It doesn’t use thick memory foam of microbeads so you won’t get the “squishiness” that many more traditional pillows possess. Rather, this neck pillow is designed with firmness in mind. Thanks to the built-in plastic ribs, you will enjoy incredibly resilient stiffness that is sure to keep your head upright. Also, the fleece-like outer fabric is quite soft. There are a few concerns worth mentioning, however. First, the fact that it is so stiff means that some people with abnormally long, wide, or short necks may find the piece uncomfortable. Also, it does tend to get a bit warm so those who are notorious for sweating when wrapped in fabric may find it to be too much. Finally, people that don’t like their necks to be so restricted and prefer more flexibility may not enjoy it. Since there is no stuffing, this product doesn’t take up nearly as much volume as many other pillows. This makes it easy to use in areas with restricted space and you can also comfortably wear it without disturbing your neighbor. However, the rib doesn’t really fold down so you can’t tuck it in as small of a storage crevice as you can with other thin neck pillows such as inflatable products. The simplicity of the design does make it very resilient, however. The towel-like fabric used is very tough and can handle being machine washed without issue. Also, the rib is made of high-quality plastic and doesn’t appear to suffer from being cracked or warped over time. This is certainly a unique look that some people may enjoy while others won’t. It resembles an oversized turtleneck more than a pillow and many people may not even think of it as a pillow when they see it. In fact, some people are able to tuck parts of it underneath their coat or blanket on particularly cold flights to the point where it is hardly noticeable. There are also 4 different color choices to pick from which is very impressive. Compared to other travel pillows on the market, the Trtl travel pillow is quite expensive. This is likely because of the unique design that has a plastic insert which we assume drives up the production cost. The fabric is also quite long and seems to be made of quality material which increases the price even further. This pillow is by no means going to break your wallet and if you are after a pillow with high levels of support then the extra few bucks isn’t a big deal, but it is still worth mentioning. The Trtl neck pillow definitely sticks to its “turtle” roots with their product that many may think makes you look like you have a neck of a turtle. The level of support you get with this product truly is in a class of its own and people who want to ensure that their neck and head stay still and upright will love it. However, it does sacrifice some softness and other typical pillow-like qualities to achieve this. Also, the price point does get bumped up some. This is a great product for those after its unique benefits but for someone who wants something more traditional, we recommend trying one of the many other standard pillows we have reviewed. World’s Best utilizes a very thick pillow that is stuffed full of their specialized microfibers. The problem is that many people might find the end result to be TOO large to the point where it forces their header to lean forward and is also quite stiff when any pressure is applied. While there is nothing wrong with a stiff pillow that provides increased neck support, most people who want a microfiber pillow are getting it for the assumed softness that microfibers tend to have. That being said, the outside material is plenty comfortable and is able to contain the internal stuffing without any protruding out and poking you. The World’s Best travel pillow can’t be compressed and stored in a way that many memory foam pillows can. This means that you will have to anticipate saving more room in your bag or suitcase if you want to store it. We recommend just wrapping it around the top of your bag and not even trying. Not only that, but this is a rather large example of the U-style and it will take up even more room than most other non-compressed U-shape pillows out there. Aside from some portability issues, the build quality is fine. We do wish that would have stuck the stuffing in an internal bag so that you could wash the outside, however. Other than being a bit on the larger side, the styling of the World’s Best travel pillow is normal. The big selling point is in their enormous selection of colors. This is one of the if not the largest array of color choices that we have come across and it means that just about everybody will be able to find a color that works for them. The asking price is very reasonable and should be well within everybody’s budget. For having a somewhat unique stuffing, this is even more impressive as typically pillows with non-standard stuffing come at a higher asking price due to the specialty material that is used. However, you do have some sacrifices such as lack of other features such as a folding mechanism and an internal stomach that holds the stuffing separately. The World’s Best travel pillow instantly caught our attention because of its stuffing. Trying to emulate the great features present in many feather-based pillows is a great approach. Unfortunately, there are some significant issues with the current design. The pillow is simply too large and firm for many people’s likings and you really don’t extract that great features of having a feather-like design. The asking price is reasonable and we do like the nice array of color choices, however. As you have likely seen, there are quite a few different types of travel pillows to choose from. Depending on your personal preferences, one type of travel pillow may be a better fit for you than another. We will briefly go over each type of travel pillow below and also list some of the common features, pros, and cons associated with each. We will be focusing on the four most popular types of travel pillows: memory foam travel pillows, inflatable travel pillows, microbead travel pillows, and down/stuffing travel pillows. Cons: Can be too warm, has to have storage bag to stay compressed, may be too firm/too soft depending on the model, inside is now machine wash friendly. Arguably the most popular, memory foam travel pillows utilize the popular foam as the primary source of both structure and comfort. While there are quite a few different memory foams to choose from, most will share some similarities. Memory foam will typically be somewhat rigid when not compressed. This allows the pillow to have a structure and also aids in providing the necessary support you need. Memory foam, as you might expect, can also be compressed to provide pressure feedback. The level of compression you will see will vary greatly from pillow to pillow. Where memory foam really shines (and one of the primary reasons it is as popular as it is) is that it has memory feedback. In other words, it will contour the shape of your body to provide extra rigidity where needed and less rigidity where not needed. If properly done, this can be extremely comfortable. Memory foam is also popular because it is relatively low cost and can be molded into just about any shape or size. For the asking price, it is also quite durable. 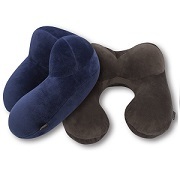 Most of the memory foam travel pillows you will come across will utilize a traditional U-shape or donut-shape. This provides support for your back and sides. Some larger memory foam pillows have also been designed to wrap around the front, providing additional support for your chin. There are some cons associated with memory foam. First, it can be a bit on the hot side. For those that are warm-natured, the foam closely hugging your skin may make things a bit too warm for your liking. Second, memory foam cannot be compressed and stay that way unless put in a small bag or other storage devices. This means that it may take up more room in your luggage if you don’t have the means to compress it and keep it compressed. Third, softer memory foam may not provide enough support for those who tend to drop their heads while sleeping. And, on the contrary, harder memory foam may be TOO firm and tilt your head out uncomfortably far from the back of the seat. Finally, it is not washing machine friendly. Many of the memory foam pillows will have an external shell that can be removed and washed but, for the most part, memory foam is meant to stay dry. Inflatable travel pillows utilize air to provide their padding. Depending on the size, this air may come either by the owner manually blowing into it or, in the case of larger pillows, may require the aid of an external pump. Inflatable travel pillows are not quite as popular as most of the other types but they do bring to the table some unique specifications. Similar to a traditional pool toy, an inflatable travel pillow will be extremely firm when aired up. 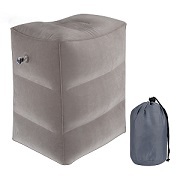 This makes it great for people wanting maximum levels of support and it allows inflatable pillows to take on all sorts of shapes and sizes that may not be possible with a less firm pillow material. Specifically, many of your side-sleeping travel pillows will utilize air. Inflatable pillows are also great for storage purposes. When you are not using it, simply deflate it and it can be stuck into a very small space, minimizing how much storage it takes up. Inflatable travel pillows are also typically very affordable. Since they don’t require internal material and simply use the air that is around us, it really drives down the cost of the materials needed and you, the consumer, reap those benefits. However, this doesn’t come without some challenges as well. Since inflatable pillows require being aired up, there is an extra step that you will have to deal with. In larger pillows, the amount of air you have to blow into it can be significant and may take several minutes and leave you out of breath. And you will have to go through this process every time you use it. Also, inflatable travel pillows are essentially thicker balloons. So any sort of hole or puncture can essentially ruin the product. This is much different than a memory foam pillow which can continue to function fine even if the outside material has a hole in it. Finally, many people will find that inflatable travel pillows are simply too firm and don’t provide the feedback that they are after. We have found that a solution to this issue is to simply let out some of the air from the pillow. This “softens” it up some will still providing good support once significant pressure is applied. Microbead travel pillows take advantage of thousands of tiny beads as the padding source. These beads can be made out of a variety of things but will typically be tiny plastic balls. Microbeads sort of fall in the middle of memory foam travel pillows and inflatable travel pillows. They are typically a bit more rigid and firm than memory foam travel pillows but are more relaxed than inflatable travel pillows. One of the great benefits of microbead travel pillows is that they do a great job of displacing heat. For people who find they are uncomfortably warm when wrapped in a memory foam pillow, going to a microbead might be just the solution that you are looking for. Furthermore, they provide a nice middle range where you can enjoy adequate firmness while still having some flexibility to make some fine adjustments to find that perfect spot for your head. However, microbead travel pillows have some common complaints as well. They are the worse type of pillow when it comes to compression and storage. Since you really can’t compress the individual beads and basically are just pushing them closer together, there is a limit on how small of a volume you can make it. This means that you will have to anticipate having more storage space to fit it. Most brands that sell microbead travel pillows don’t even attempt to hide this issue. Many of the manufacture photos will simply show the pillow sitting on top of the suitcase rather than being stuffed in a bag and few will come with any sort of carrying case. Microbead travel pillows are also limited in the shapes and styles that they can be. Since the balls don’t have a static structure in the sense that memory foam does, you will not find a lot of exotic shapes to choose from. Most pillows will be simple U-shapes with the occasional J-shape thrown in. Microbeads can also be a bit fragile. Similar to inflatable pillows, a puncture on the surface of the pillow can allow the small beads to fall out which not only makes a huge mess but also essentially ruins the pillow. Finally, microbead pillows tend to be one of the more expensive examples. We assume that the production costs with microbeads are higher than with other materials. There are also quite a few travel pillows that utilize feathers or other types of traditional stuffing. This is a pretty broad spectrum and many of the specifics will depend on the particular product, but there are some common features. From a firmness standpoint, these types of pillows will typically trend towards the softer side. In fact, many people will consider down travel pillows to be among the softest and most comfortable. The feathers or other stuffing do a fantastic job of applying just the perfect amount of pressure and also compressing when need be. In addition, stuffing-based travel pillows will usually be on the cool side compared to memory foam. Similar to microbeads, the fact that air can travel around the elements inside really helps to cool things off and keep you comfortable during a long flight. They will also typically last longer than an inflatable or microbead travel pillow. A small hole in the side of one doesn’t spell disaster and the internal stuffing can oftentimes be kept inside without issue. As for the cons, down travel pillows may not be firm enough for some and will lack the rigidity for many styles and shapes of the pillow. If you are someone after a product with good chin support, for example, you may be hard-pressed to find a down stuffing travel pillow that will meet your needs. Depending on the specific material used, the asking price may be a bit on the higher side as well. Feathers and some of the more specialized stuffing can creep up there in price. 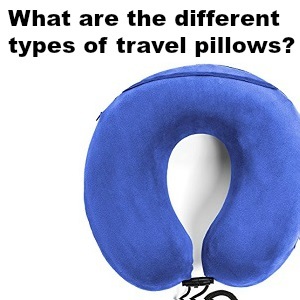 1.5 What are the Different Types of Travel Pillows?